jmjimage – Jeff Mulvihill, Jr.’s Personal Work (owner of instaimage)… providing the west with professional photography. Jeff Mulvihill, Jr.’s Personal Work (owner of instaimage)… providing the west with professional photography. 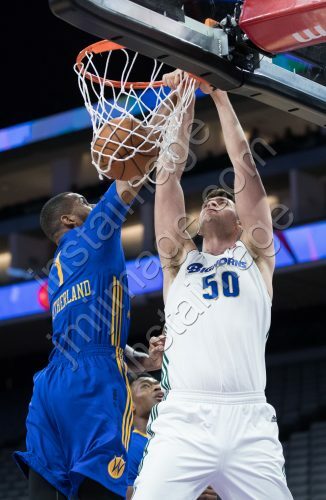 SACRAMENTO, Calif. —- The Reno Bighorns (13-23) defeated the Santa Cruz Warriors (19-17) 109-108 Friday night at the Golden 1 Center. The Bighorns established a new single-game franchise attendance record with a crowd of 5,106 packing Golden 1 Center in the first-ever D-League game on Sacramento’s home floor. 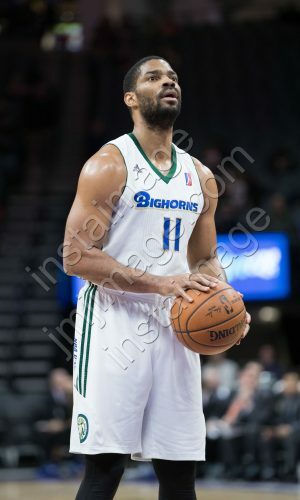 Gary Neal (12-20 FG) led the Bighorns with 41 points and eight rebounds while Sacramento Kings Assignment Player Georgios Papagiannis recorded his sixth double-double of the season with 16 points and 10 rebounds. 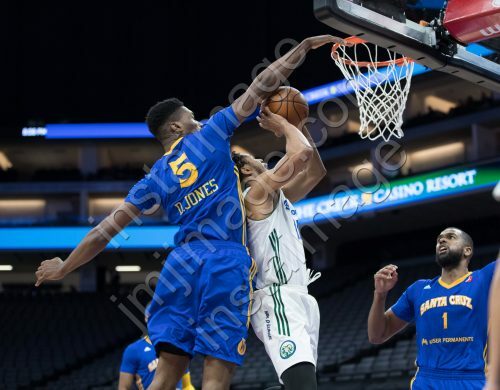 Reggie Hearn notched 17 points and two rebounds. .
James Southerland paced the Warriors with 27 points and 11 rebounds while Phil Pressey had 12 points six rebounds and 10 assists. 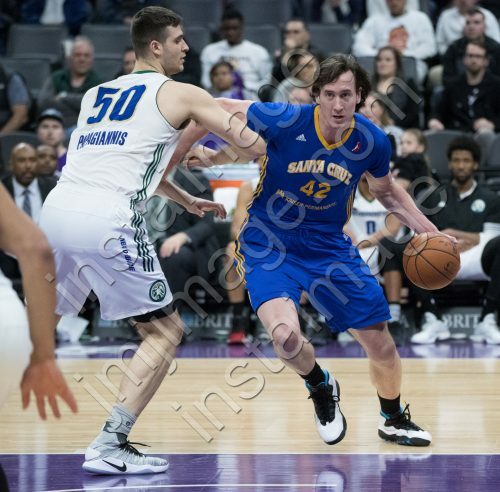 The teams kept the score close opening the first frame before the Warriors went on a run to hold an 11-point advantage at the midway point, the Warriors would hold the advantage over the Bighorns through the entirety of the period. 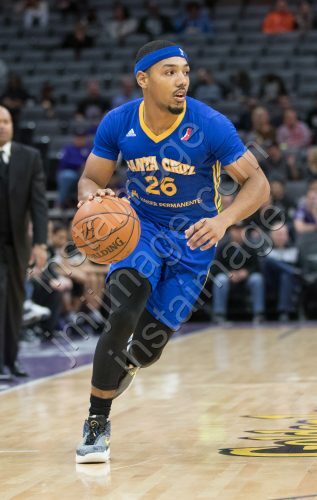 Despite the Bighorns outscoring the Warriors 26-20 in the second frame, Santa Cruz went into the locker room with a 17-point cushion. The Warriors led by as much as 25 in the second frame. The Bighorns went on a 17-7 run coming out of the break to cut the deficit to seven at the 6:41 mark. Reno would gain momentum and get within five points after back-to-back triples from Hearn and Neal. 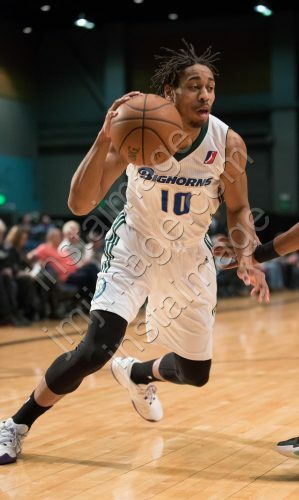 The Bighorns went into the final frame trailing Santa Cruz 77-68. With 7:01 remaining in the final frame, Reno went on a 13-6 run to tie the Warriors after a pull-up jump-shot from Neal at the 3:09 mark. The lone lead change in the game would come from a made free throw from Papagiannis at the 2:31 mark. The Warriors would tie the Bighorns one final time off a made three-pointer from Henton, but would never take back a lead. 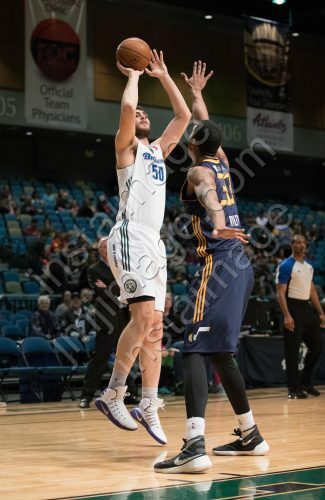 In the final second of regulation, a made three-point shot from Scott Wood brought the Warriors within one point with time expiring, resulting in a Bighorns victory. Gary Neal scored 23 of his 41 points in the final frame. 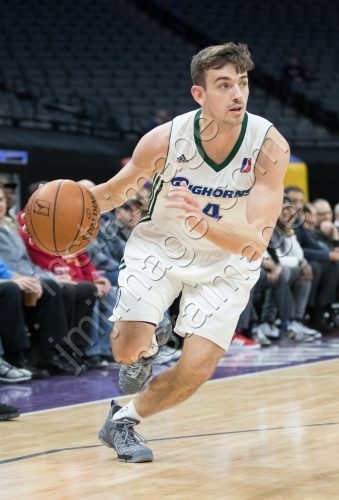 The Bighorns outscored the Warriors 72-54 in the second half and finished the night going 100% from the free-throw line. Reno will host the Windy City Bulls on Wednesday, Feb. 3 at 11 a.m. for their 2017 Education Game. The Reno Bighorns are a member of the NBA Development League, the official minor league of the NBA. The Bighorns are affiliated with the Sacramento Kings. Season tickets for the 2016-17 season are on sale now! For more information, call the Bighorns front office at 775-853-8220 or visit RenoBighorns.com. 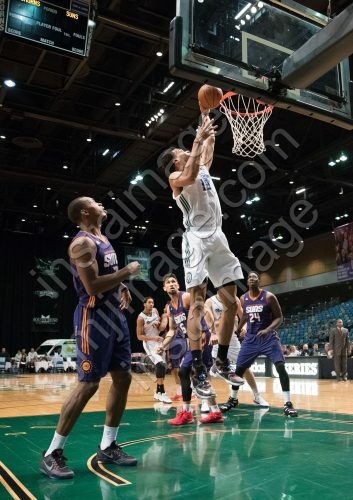 Follow us on Twitter @renobighorns and “like” the Bighorns on Facebook at facebook.com/bighornshoops. The NBA Development League is the NBA’s official minor league, preparing players, coaches, officials, trainers, and front-office staff for the NBA while acting as the league’s research and development laboratory. Featuring 22 teams with direct affiliations with NBA franchises for the 2016-17 season, the league offers elite professional basketball at an affordable price in a fun, family-friendly atmosphere. An all-time high 38 percent of all NBA players at the end of the 2015-16 season boasted NBA D-League experience. In fostering the league’s connection to the community, its teams, players and staff promote health and wellness, support local needs and interests, and assist in educational development through NBA D-League Cares programs. Fans can watch all NBA D-League games on nbadleague.com. 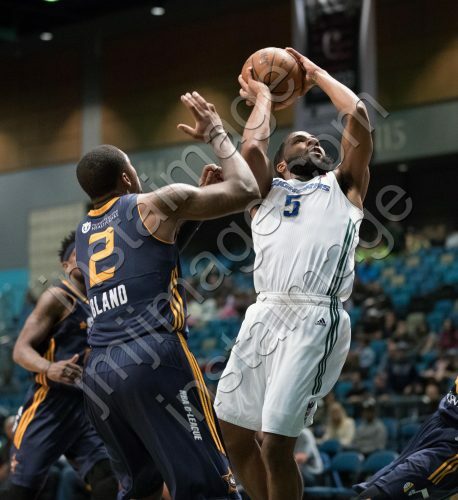 Reno Bighorn Guard PE’SHON HOWARD (5) drives during the NBA D-League Basketball game between the Reno Bighorns and the Iowa Energy at the Reno Events Center in Reno, Nevada. 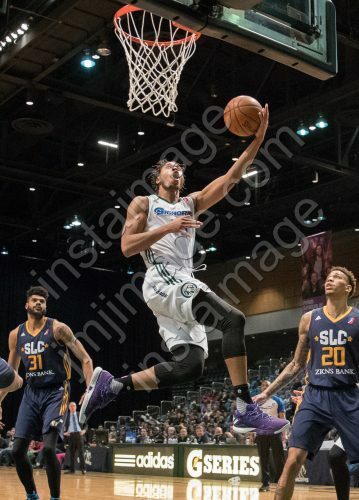 Reno Bighorn Guard ISAIAH COUSINS (10) shoots a layup during the NBA D-League Basketball game between the Reno Bighorns and the Salt Lake City Stars at the Reno Events Center in Reno, Nevada. 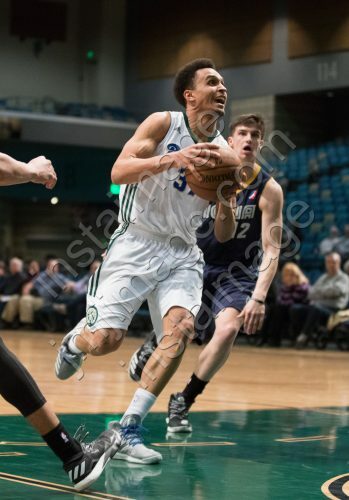 Reno Bighorn Guard PE’SHON HOWARD (5) drives against Salt Lake City Stars Guard MARCUS PAIGE (4) during the NBA D-League Basketball game between the Reno Bighorns and the Salt Lake City Stars at the Reno Events Center in Reno, Nevada. 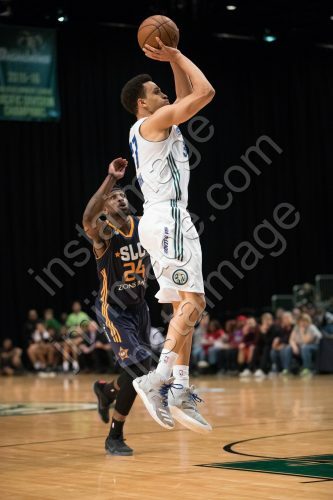 Reno Bighorn Guard PE’SHON HOWARD (5) shoots against Salt Lake City Stars Guard MARCUS PAIGE (4) during the NBA D-League Basketball game between the Reno Bighorns and the Salt Lake City Stars at the Reno Events Center in Reno, Nevada. 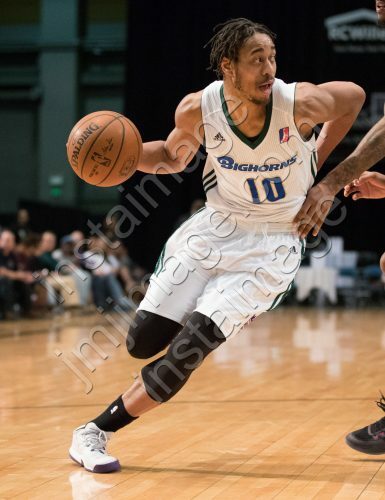 Reno Bighorn Guard ISAIAH COUSINS (10) during the NBA D-League Basketball game between the Reno Bighorns and the Salt Lake City Stars at the Reno Events Center in Reno, Nevada. 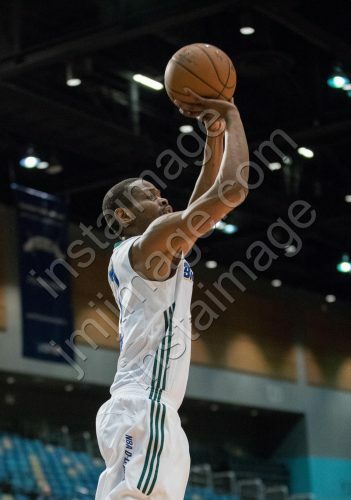 Reno Bighorn Guard PE’SHON HOWARD (5) shoots for three during the NBA D-League Basketball game between the Reno Bighorns and the Salt Lake City Stars at the Reno Events Center in Reno, Nevada. 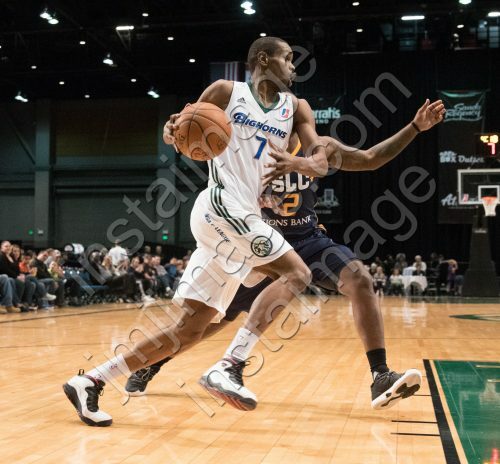 Reno Bighorn Guard REGGIE HEARN (37) drives against Salt Lake City Stars Guard JERMAINE TAYLOR (24) during the NBA D-League Basketball game between the Reno Bighorns and the Salt Lake City Stars at the Reno Events Center in Reno, Nevada. 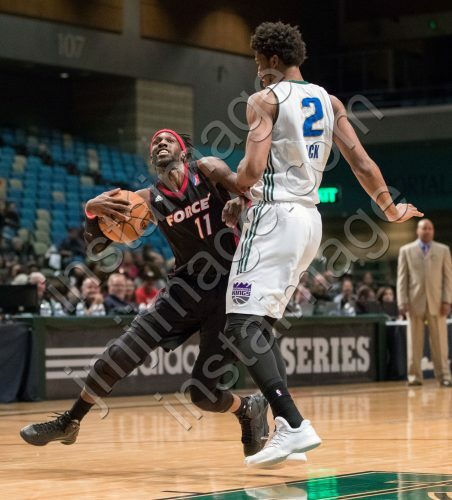 Reno Bighorn Forward WILL DAVIS II (0) drives against Salt Lake City Stars Forward JJ O’BRIEN (22) during the NBA D-League Basketball game between the Reno Bighorns and the Salt Lake City Stars at the Reno Events Center in Reno, Nevada. 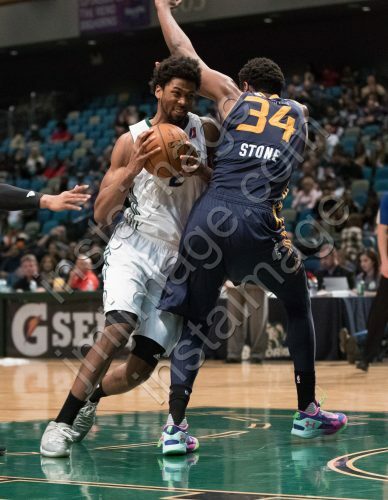 Reno Bighorn Guard CAM GRIFFIN (4) defends against Salt Lake City Stars Forward JJ O’BRIEN (22) during the NBA D-League Basketball game between the Reno Bighorns and the Salt Lake City Stars at the Reno Events Center in Reno, Nevada. 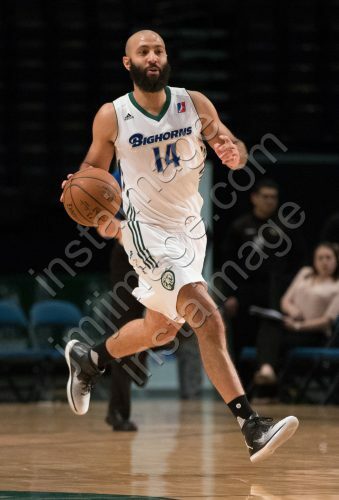 Reno Bighorn Guard KENDALL MARSHALL (14) during the NBA D-League Basketball game between the Reno Bighorns and the Salt Lake City Stars at the Reno Events Center in Reno, Nevada. 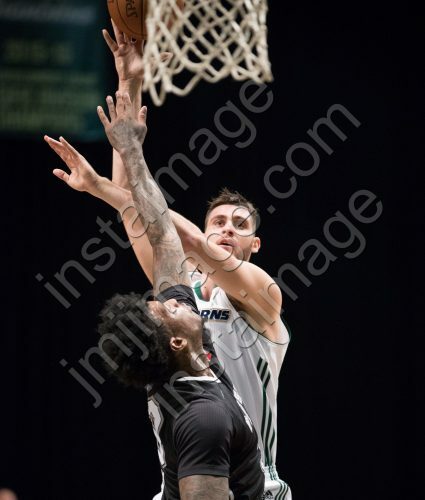 Reno Bighorn Center GEORGIOS PAPAGIANNIS (50) shoots over Salt Lake City Stars Forward JOEL BOLOMBOY (21) during the NBA D-League Basketball game between the Reno Bighorns and the Salt Lake City Stars at the Reno Events Center in Reno, Nevada. 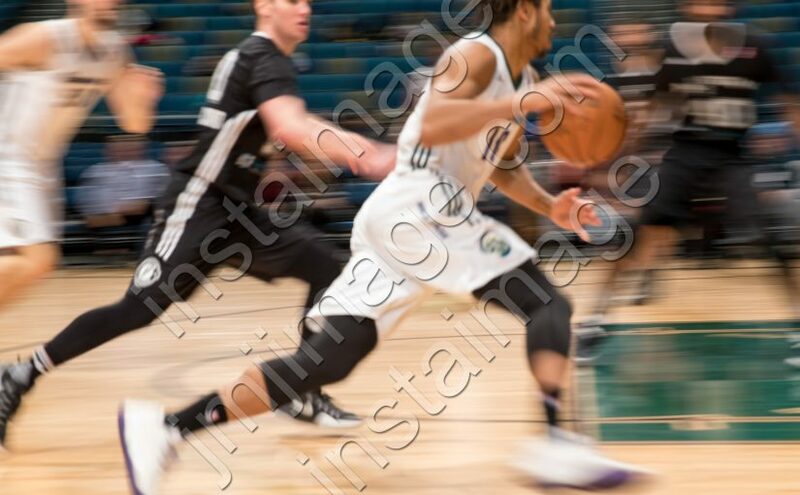 Reno Bighorn Guard ISAIAH COUSINS (10) drives during the NBA D-League Basketball game between the Reno Bighorns and the Salt Lake City Stars at the Reno Events Center in Reno, Nevada. 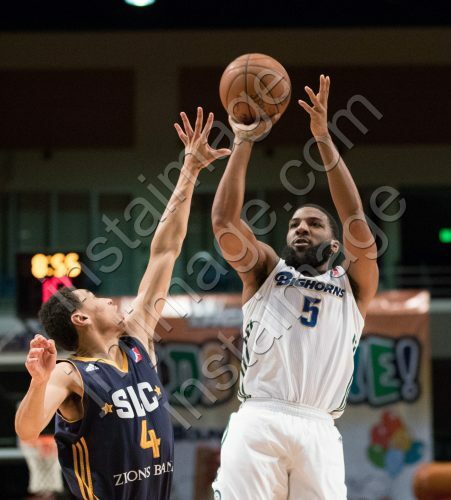 Reno Bighorn Guard PE’SHON HOWARD (5) shoots against Salt Lake City Stars Guard JAYLEN BLAND (2) during the NBA D-League Basketball game between the Reno Bighorns and the Salt Lake City Stars at the Reno Events Center in Reno, Nevada. 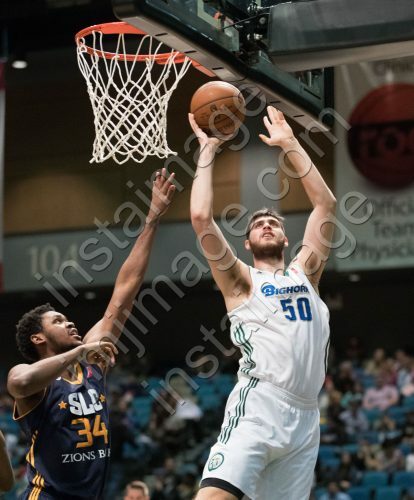 Reno Bighorn Center GEORGIOS PAPAGIANNIS (50) shoots over Salt Lake City Stars Center DIAMOND STONE (34) during the NBA D-League Basketball game between the Reno Bighorns and the Salt Lake City Stars at the Reno Events Center in Reno, Nevada. 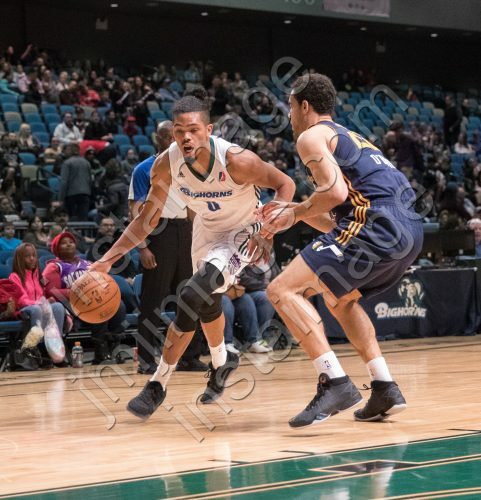 Reno Bighorn Guard REGGIE HEARN (37) drives past Salt Lake City Stars Guard JERMAINE TAYLOR (24) during the NBA D-League Basketball game between the Reno Bighorns and the Salt Lake City Stars at the Reno Events Center in Reno, Nevada. 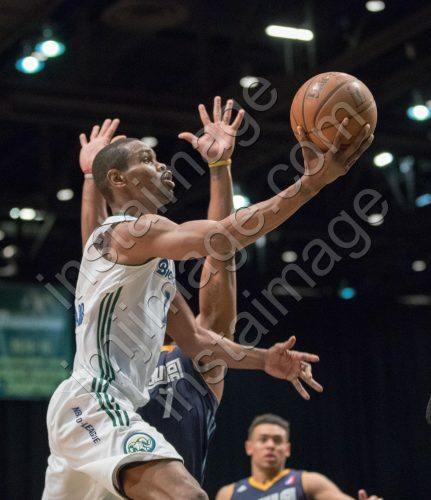 Reno Bighorn Guard REGGIE HEARN (37) shoots against Salt Lake City Stars Guard JERMAINE TAYLOR (24) during the NBA D-League Basketball game between the Reno Bighorns and the Salt Lake City Stars at the Reno Events Center in Reno, Nevada. 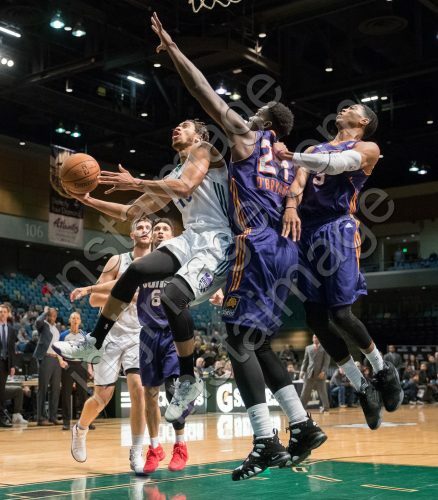 Reno Bighorn Guard REGGIE HEARN (37) shoots a layup against Salt Lake City Stars Guard SUNDIATA GAINES (15) during the NBA D-League Basketball game between the Reno Bighorns and the Salt Lake City Stars at the Reno Events Center in Reno, Nevada. 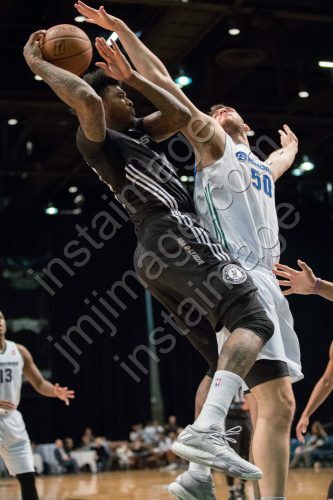 Reno Bighorn Forward KADEEM JACK (2) drives against Salt Lake City Stars Center DIAMOND STONE (34) during the NBA D-League Basketball game between the Reno Bighorns and the Salt Lake City Stars at the Reno Events Center in Reno, Nevada. 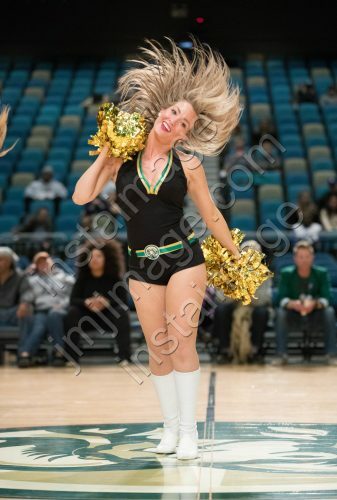 The Lady Bighorn Dancers perform during the NBA D-League Basketball game between the Reno Bighorns and the Salt Lake City Stars at the Reno Events Center in Reno, Nevada. The Reno Lady Bighorn Dancers join the Reno Bighorns for a prayer after the NBA D-League Basketball game between the Reno Bighorns and the Salt Lake City Stars at the Reno Events Center in Reno, Nevada. 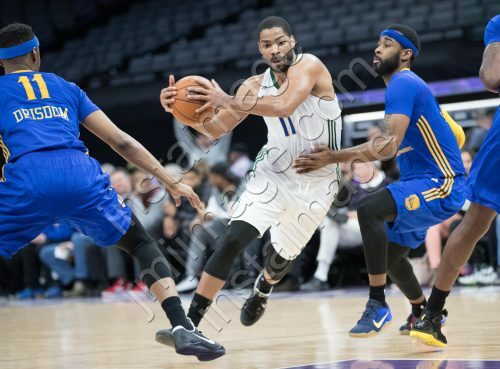 RENO, Nev. —- The Reno Bighorns (11-20) fell 121-104 to the Salt Lake City Stars (10-20) Friday night at the in front of a near sold out crowd at the Reno Events Center. 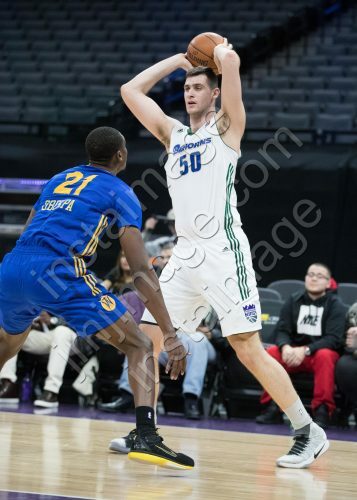 Sacramento Kings Assignment Player Georgios Papagiannis led the Bighorns with 22 points and five rebounds while Pe’Shon Howard notched 20 points and five rebounds. 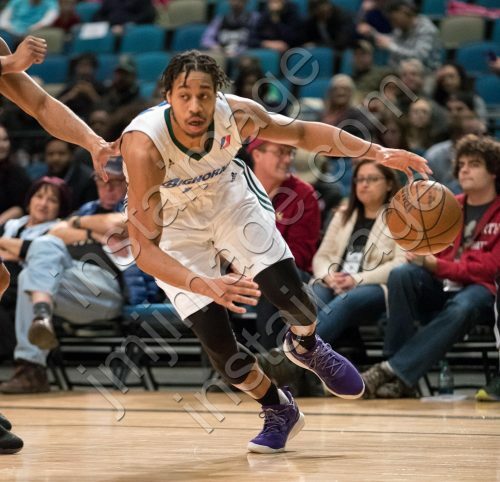 Kings affiliate player Isaiah Cousins scored 20 points, grabbed five rebounds and added five assists. Sundiata Gaines paced the Stars logging a double-double with 27 points, 11 assists and nine rebounds while Joel Bolomboy, who is on assignment from the Utah Jazz had 20 points, 17 rebounds and three assists. 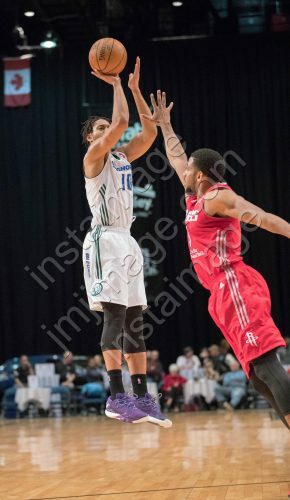 The Stars took control of the game early going on a 17-5 run to lead the Bighorns by 14 at the 7:25 mark. The Bighorns would get within six points before the Stars ran away with the lead to have a 32-18 lead by the end of the first quarter. The Stars kept the Bighorns at bay with a double-digit lead until the Reggie Hearn sunk a triple with 6:42 left in play in the first half to cut the deficit to nine. The Stars held the advantage over the Bighorns the remainder of the frame having a 12-point cushion heading into the locker room. Papagiannis ended the first half with 14 points. 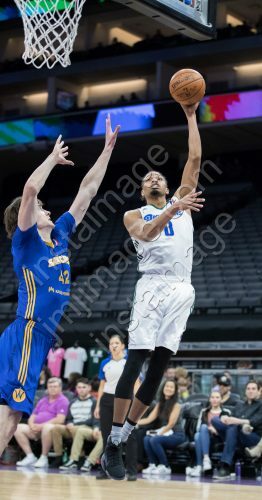 The Bighorns went on a 9-2 run coming out of the break to edge the Stars 64-63 behind a three from Howard at the 9:23 mark. The Stars responded with a late 22-4 run to ensure a 14-point advantage heading into the final frame. Howard opened the fourth quarter with a jumper before Will Davis stepped to the line to make a free throw to cut the deficit to 11. 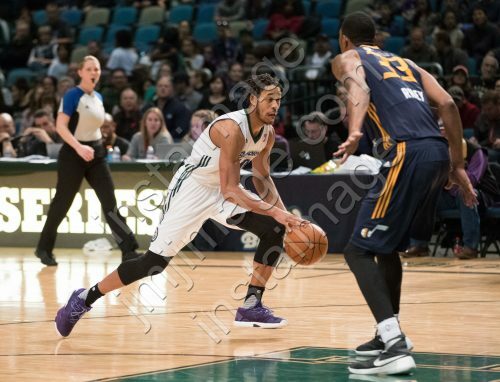 The Bighorns were unable to overcome the Stars lead, ultimately dropping 121-104 to Salt Lake City. 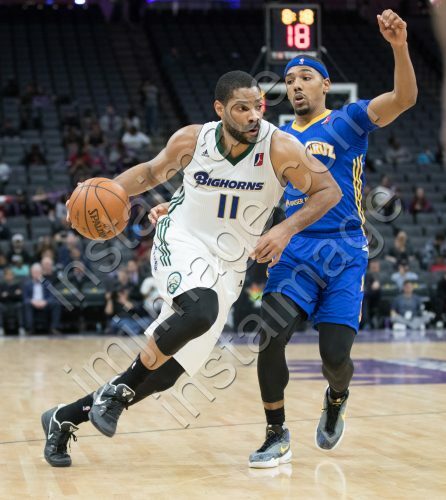 The Bighorns will next travel to Erie to face the Bayhawks on Thursday, Feb. 9 at 4 P.M PST. Reno Bighorn Guard ISAIAH COUSINS (10) drives during the NBA D-League Basketball game between the Reno Bighorns and the Iowa Energy at the Reno Events Center in Reno, Nevada. 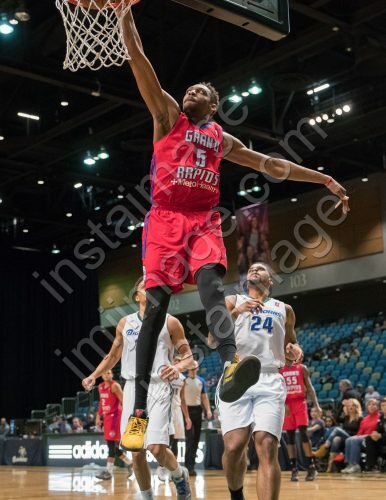 Reno Bighorn Guard RENALDO MAJOR (7) shoots a layup during the NBA D-League Basketball game between the Reno Bighorns and the Iowa Energy at the Reno Events Center in Reno, Nevada. Reno Bighorn Guard MARK TYNDALE (1) drives during the NBA D-League Basketball game between the Reno Bighorns and the Iowa Energy at the Reno Events Center in Reno, Nevada. 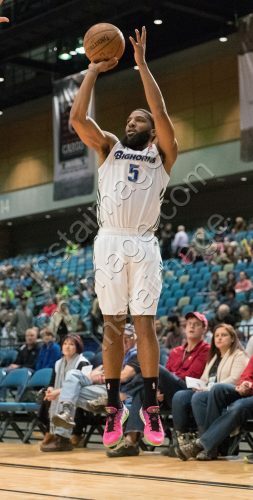 Reno Bighorn Guard RENALDO MAJOR (7) shoots a three during the NBA D-League Basketball game between the Reno Bighorns and the Iowa Energy at the Reno Events Center in Reno, Nevada. 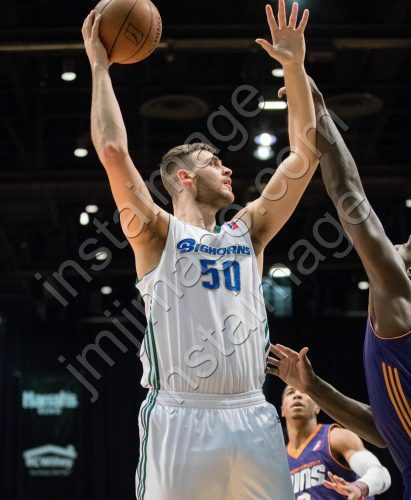 Reno Bighorn Center GEORGIOS PAPAGIANNIS (50) shoots from inside during the NBA D-League Basketball game between the Reno Bighorns and the Iowa Energy at the Reno Events Center in Reno, Nevada. 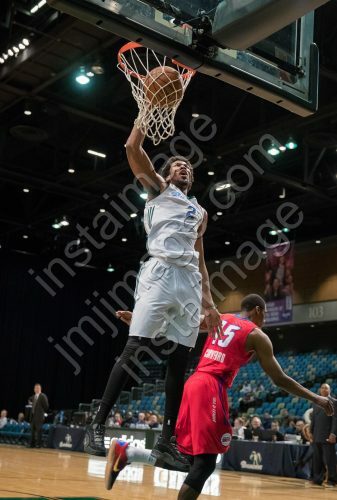 Reno Bighorn Guard ISAIAH COUSINS (10) dunks during the NBA D-League Basketball game between the Reno Bighorns and the Iowa Energy at the Reno Events Center in Reno, Nevada. 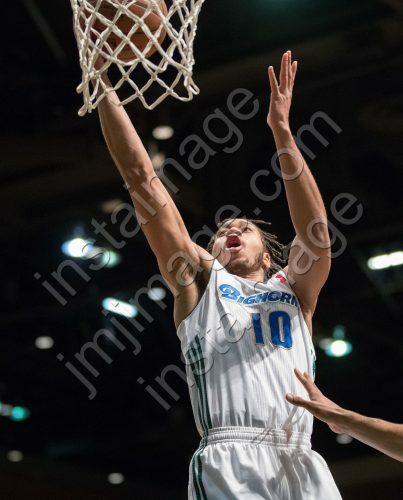 Reno Bighorn Guard ISAIAH COUSINS (10) elevates and shoots over the Iowa Energy during the NBA D-League Basketball game between the Reno Bighorns and the Iowa Energy at the Reno Events Center in Reno, Nevada. The Reno Lady Bighorn Dancers perform during the NBA D-League Basketball game between the Reno Bighorns and the Iowa Energy at the Reno Events Center in Reno, Nevada. Reno Bighorn Forward KADEEM JACK (2) elevates for a shot during the NBA D-League Basketball game between the Reno Bighorns and the Iowa Energy at the Reno Events Center in Reno, Nevada. 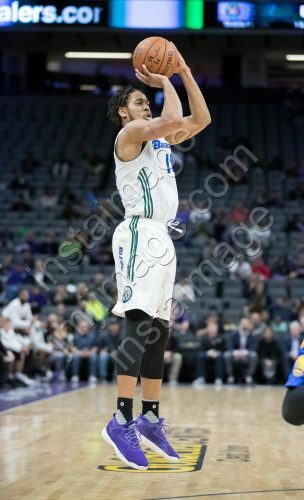 Reno Bighorn Guard ISAIAH COUSINS (10) shoots from the corner during the NBA D-League Basketball game between the Reno Bighorns and the Iowa Energy at the Reno Events Center in Reno, Nevada. Reno Bighorn Guard REGGIE HEARN (37) drives into the paint during the NBA D-League Basketball game between the Reno Bighorns and the Iowa Energy at the Reno Events Center in Reno, Nevada. 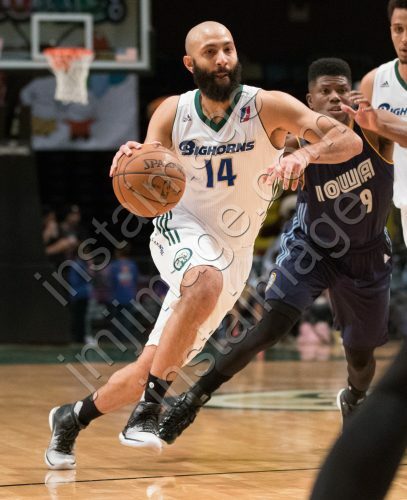 Reno Bighorn Guard KENDALL MARSHALL (14) drives during the NBA D-League Basketball game between the Reno Bighorns and the Iowa Energy at the Reno Events Center in Reno, Nevada. 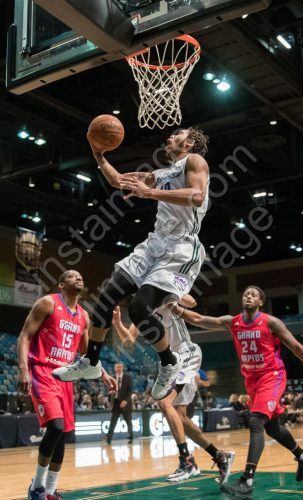 RENO, Nev. —- The Reno Bighorns (11-19) fell to the Iowa Energy (7-21) 106-104 Wednesday night at the Reno Events Center. 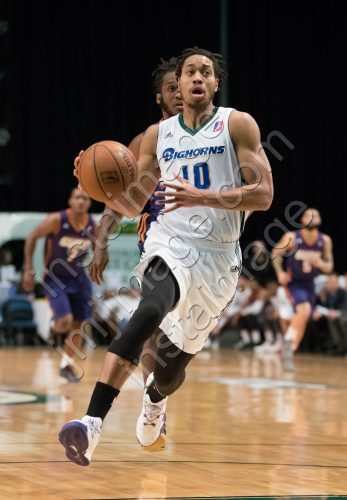 Pe’Shon Howard led the Bighorns with 29 points and three assists as Reggie Hearn notched 19 points and seven rebounds. Sacramento Kings Assignment Player Georgios Papagiannis followed Hearn closely scoring 18 points and grabbing four rebounds. Cartier Martin paced the Energy with 24 points and eight rebounds while Wayne Selden and Wade Baldwin poured in 20 points each. After a tight first quarter, the Energy led by one, 30-29. Howard led all scorers in the first frame, netting 15 of his 29 points on 6-7 shooting. The head-to-head battle carried through to a tightly-contested second frame with the Bighorns winning the quarter 26-23. Neither team led by more than four points in the frame, despite the quarter seeing five lead changes and three ties. 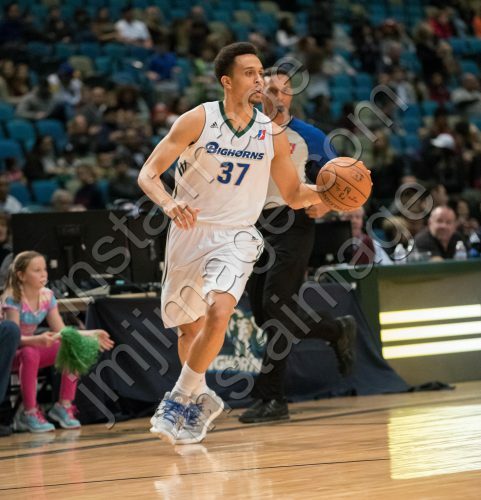 The Bighorns went into the locker room at the half leading the Energy 55-53. 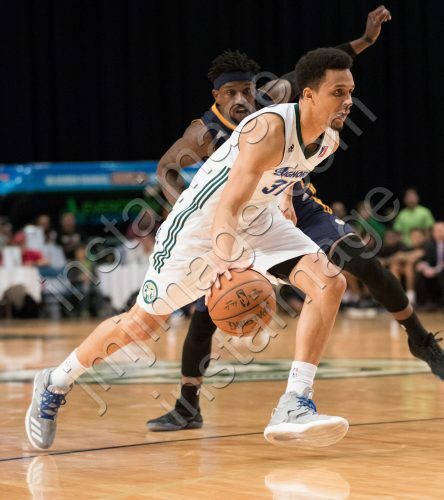 The Bighorns held a nine-point lead over the Energy after going on a 9-2 run behind a triple from Hearn in the opening two minutes of the third quarter. The Bighorn would not relinquish the lead in the frame, despite the Energy edging the Bighorns by one twice in the frame. The Bighorns held a one-point advantage over the Energy to enter the final quarter. Baldwin stepped to the line after being fouled by Howard in the opening seconds of fourth quarter, tying the score at 78. The Bighorns pulled away by four points at the 10:23 mark. 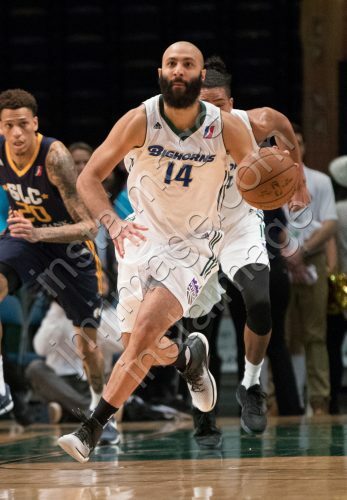 The two teams exchanged the lead five times and tied four times in nine minutes with the Bighorns having a 104-103 lead with 54.4 left in play. Martin, Selden and Wes Washpun both went to the line after being fouled to make one-point each to retake control of the lead. The Bighorns would in-bound the ball with .8 left in play but would not get a shot off in time, giving the Energy a 106-104 victory. The Bighorns will host the Salt Lake City Stars on Friday, Feb. 3 at 7 p.m.
Reno Bighorn Center GEORGIOS PAPAGIANNIS (50) shoots over Salt Lake City Stars Center DA’SHONTE RILEY (33) during the NBA D-League Basketball game between the Reno Bighorns and the Salt Lake City Stars at the Reno Events Center in Reno, Nevada. 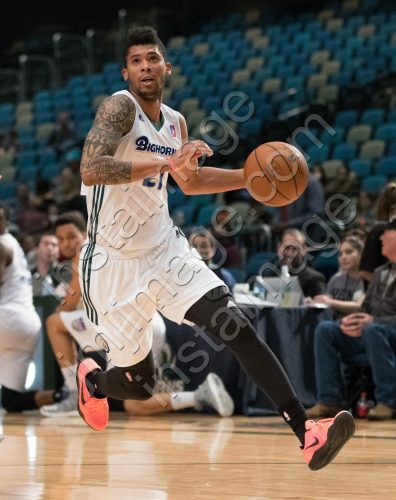 Reno Bighorn Guard REGGIE HEARN (37) during the NBA D-League Basketball game between the Reno Bighorns and the Salt Lake City Stars at the Reno Events Center in Reno, Nevada. 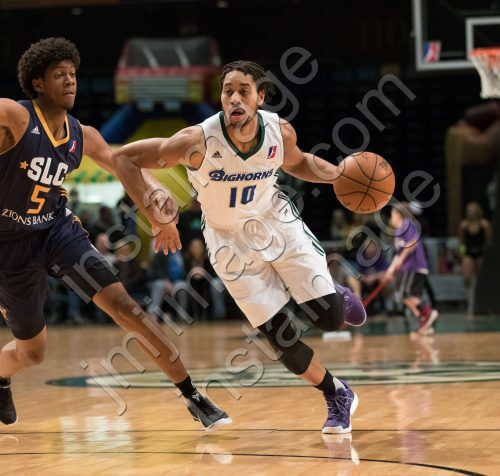 Reno Bighorn Guard ISAIAH COUSINS (10) drives past Salt Lake City Stars Guard TYRONE WALLACE (5) during the NBA D-League Basketball game between the Reno Bighorns and the Salt Lake City Stars at the Reno Events Center in Reno, Nevada. 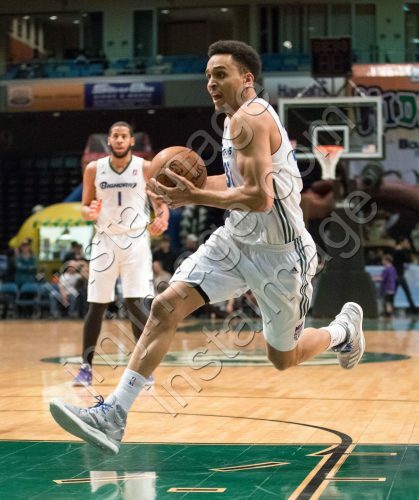 Reno Bighorn Guard RENALDO MAJOR (7) drives past Salt Lake City Stars Forward BRANNEN GREENE (14) during the NBA D-League Basketball game between the Reno Bighorns and the Salt Lake City Stars at the Reno Events Center in Reno, Nevada. 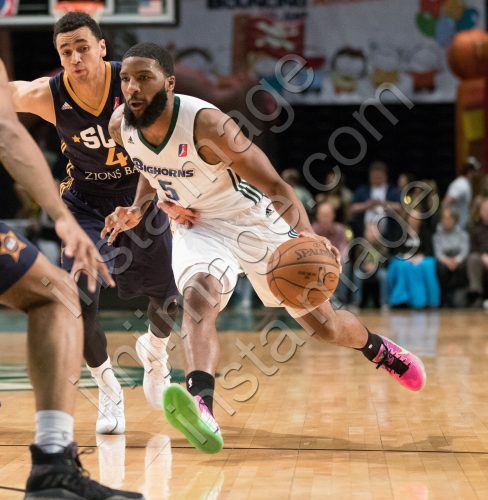 Reno Bighorn Guard REGGIE HEARN (37) drives during the NBA D-League Basketball game between the Reno Bighorns and the Salt Lake City Stars at the Reno Events Center in Reno, Nevada. 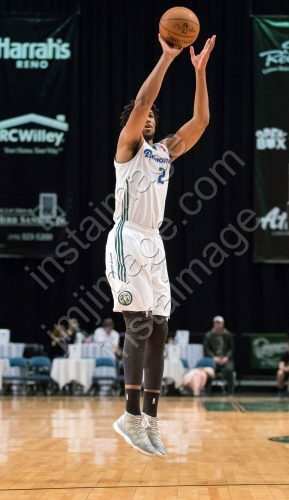 Reno Bighorn Guard REGGIE HEARN (37) shoots a layup during the NBA D-League Basketball game between the Reno Bighorns and the Salt Lake City Stars at the Reno Events Center in Reno, Nevada. The Sacramento Kings Dancers perform during the NBA D-League Basketball game between the Reno Bighorns and the Salt Lake City Stars at the Reno Events Center in Reno, Nevada. 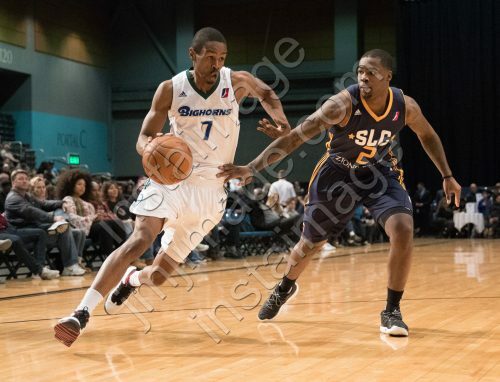 Reno Bighorn Guard RENALDO MAJOR (7) drives past Salt Lake City Stars Guard JAYLEN BLAND (2) during the NBA D-League Basketball game between the Reno Bighorns and the Salt Lake City Stars at the Reno Events Center in Reno, Nevada. 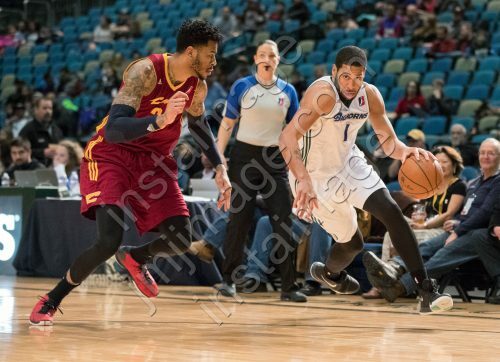 Reno Bighorn Guard MARK TYNDALE (1) drives around Salt Lake City Stars Forward MICHALE KYSER (20) during the NBA D-League Basketball game between the Reno Bighorns and the Salt Lake City Stars at the Reno Events Center in Reno, Nevada. 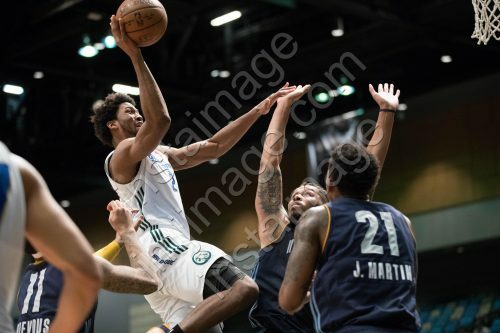 Reno Bighorn Guard ISAIAH COUSINS (10) elevates for a reverse layup during the NBA D-League Basketball game between the Reno Bighorns and the Salt Lake City Stars at the Reno Events Center in Reno, Nevada. 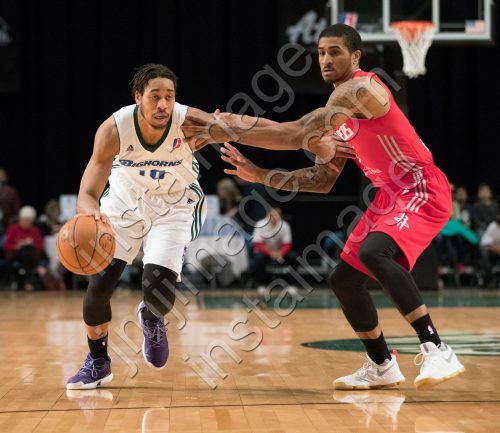 Reno Bighorn Guard ISAIAH COUSINS (10) drives against Salt Lake City Stars Center DA’SHONTE RILEY (33) during the NBA D-League Basketball game between the Reno Bighorns and the Salt Lake City Stars at the Reno Events Center in Reno, Nevada. The Sacramento Kings Dancers throw t-shirts to the crowd during the NBA D-League Basketball game between the Reno Bighorns and the Salt Lake City Stars at the Reno Events Center in Reno, Nevada. 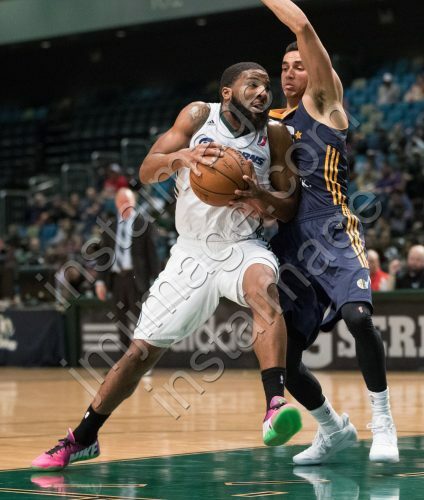 RENO, Nev. —- The Reno Bighorns (11-18) fell to the Salt Lake City Stars (8-20) 107-106 Sunday night in front of a sellout at the Reno Events Center. 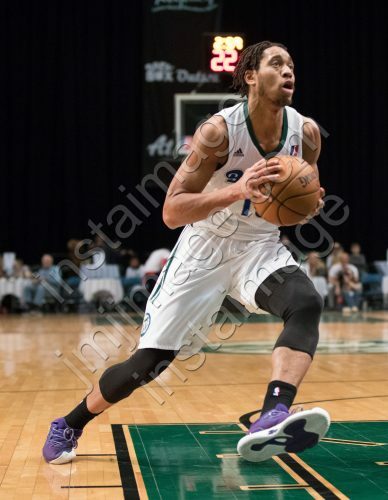 Reggie Hearn led the Bighorns with his season-high 30 points and added 10 rebounds and two assists while Kings affiliate player Isaiah Cousins notched 26 points, four rebounds and 10 assists. Renaldo Major totaled 17 points in the Sunday night contest. Jermaine Taylor paced the Stars with 27 points and six rebounds while Tyrone Wallace scored 26 points, four rebounds and five assists. 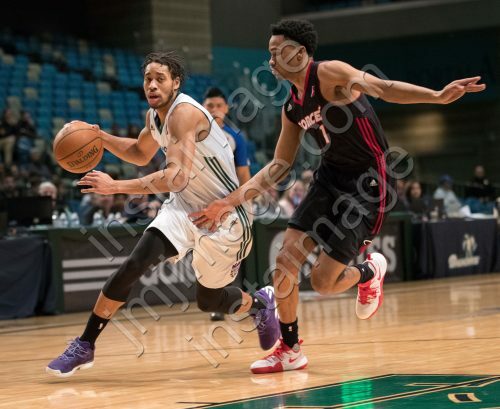 The Bighorns opened up the first frame going on a 9-3 run to hold the advantage over the Stars at the 8:00 mark. The Spurs responded with a 10-4 run, tying the game at 13 a piece at the mid-way point of the first frame. The Stars held a 10-point advantage over the Bighorns to enter the second frame. 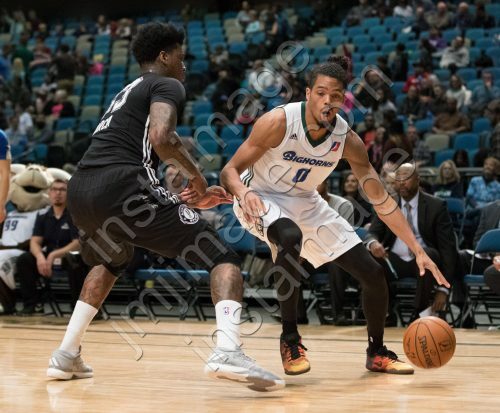 The Stars would hold their double-digit lead over the Bighorns before the Bighorns went on a 17-6 run behind a triple from Major to take a 44-43 lead at the 4:30 mark. The teams would exchange the lead times in four minutes with Reno holding a 50-49 lead at the half. The battle was head-to-head in the third frame. Despite Cousins scoring 11 of his 26 points in the quarter, the Stars won the frame 31-25. Neither team led by more than five points in the frame, the quarter saw nine lead changes and four ties. The Stars held a 80-75 lead at the end of the frame. The Stars held the upper hand on the Bighorns to open the final frame before the Bighorns went on an 11-4 run to hold a one-point advantage over the Stars with 7:31 left in play. The teams fought to control the lead, exchanging the lead five times and tying twice in five minutes. The Stars had a 106-100 lead with 46.3 left in play. Hearn sunk two triples in the final 2.4 seconds to end the game edging the Stars 107-106. Hearn scored 15 of his 30 points in the final frame behind a 5-7 shooting effort. The Bighorns will return to the Reno Events Center on Wednesday, Feb. 1 to host the Iowa Energy at 7 p.m.
Reno Bighorn Guard ISAIAH COUSINS (10) drives against Rio Grande Valley Viper Guard GARY PAYTON II (0) during the NBA D-League Basketball game between the Reno Bighorns and the Rio Grande Valley Vipers at the Reno Events Center in Reno, Nevada. 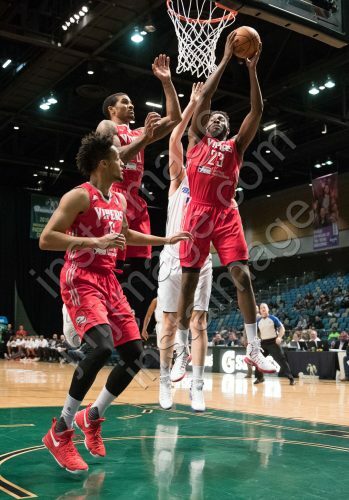 Reno Bighorn Guard LAMAR PATTERSON (13) shoots against Rio Grande Valley Viper Center CHINANU ONUAKU (23) during the NBA D-League Basketball game between the Reno Bighorns and the Rio Grande Valley Vipers at the Reno Events Center in Reno, Nevada. 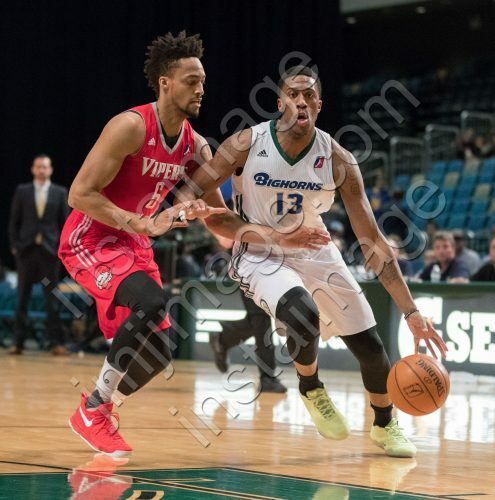 Reno Bighorn Guard LAMAR PATTERSON (13) drives against Rio Grande Valley Viper Forward JP TOKOTO (6) during the NBA D-League Basketball game between the Reno Bighorns and the Rio Grande Valley Vipers at the Reno Events Center in Reno, Nevada. 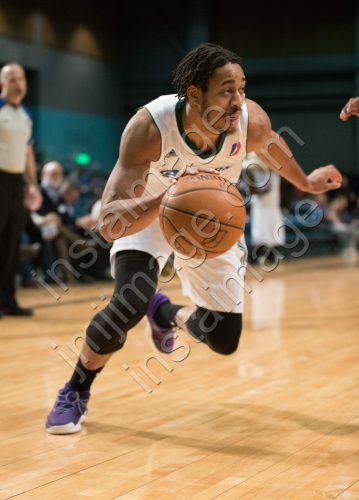 Reno Bighorn Guard ISAIAH COUSINS (10) drives during the NBA D-League Basketball game between the Reno Bighorns and the Rio Grande Valley Vipers at the Reno Events Center in Reno, Nevada. 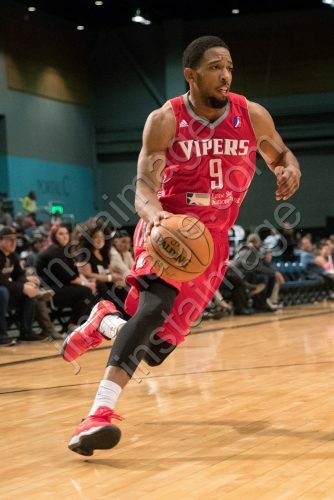 Rio Grande Valley Viper Center CHINANU ONUAKU (23) pulls down a rebound during the NBA D-League Basketball game between the Reno Bighorns and the Rio Grande Valley Vipers at the Reno Events Center in Reno, Nevada. 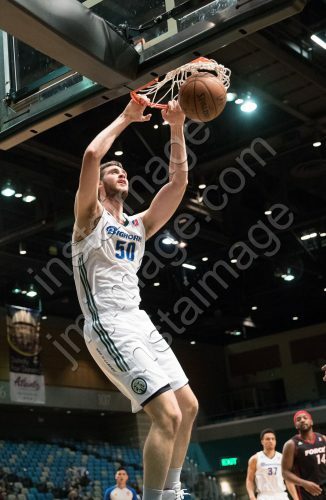 Reno Bighorn Center GEORGIOS PAPAGIANNIS (50) throws down a monster dunk during the NBA D-League Basketball game between the Reno Bighorns and the Rio Grande Valley Vipers at the Reno Events Center in Reno, Nevada. 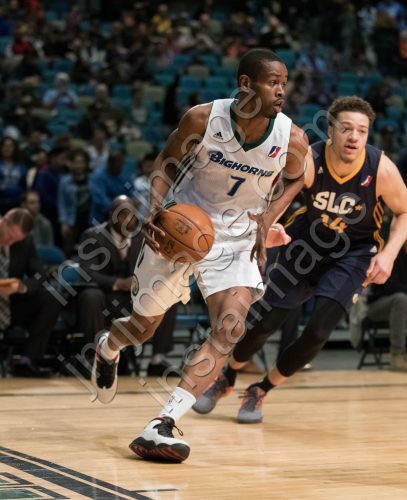 Reno Bighorn Forward KADEEM JACK (2) drives to the hoop during the NBA D-League Basketball game between the Reno Bighorns and the Rio Grande Valley Vipers at the Reno Events Center in Reno, Nevada. 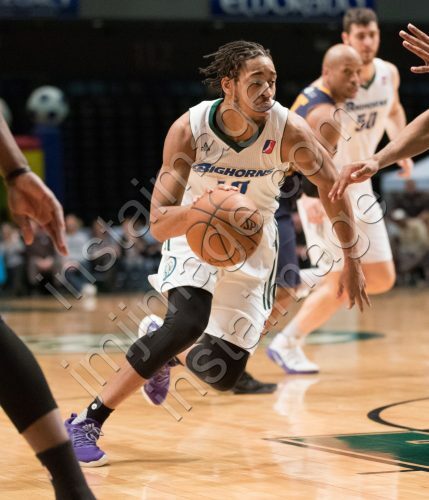 Reno Bighorn Guard ISAIAH COUSINS (10) drives to the hoop during the NBA D-League Basketball game between the Reno Bighorns and the Rio Grande Valley Vipers at the Reno Events Center in Reno, Nevada. 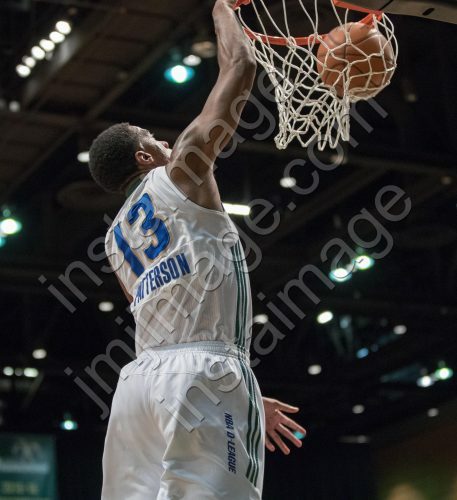 Reno Bighorn Guard LAMAR PATTERSON (13) dunks during the NBA D-League Basketball game between the Reno Bighorns and the Rio Grande Valley Vipers at the Reno Events Center in Reno, Nevada. 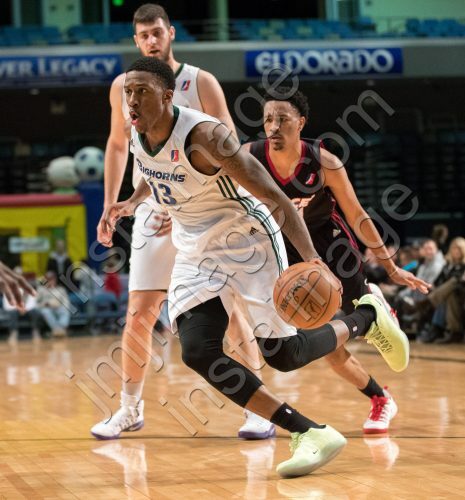 Reno Bighorn Guard LAMAR PATTERSON (13) drives to the hoop during the NBA D-League Basketball game between the Reno Bighorns and the Rio Grande Valley Vipers at the Reno Events Center in Reno, Nevada. The Lady Bighorn Dancers perform during the NBA D-League Basketball game between the Reno Bighorns and the Rio Grande Valley Vipers at the Reno Events Center in Reno, Nevada. 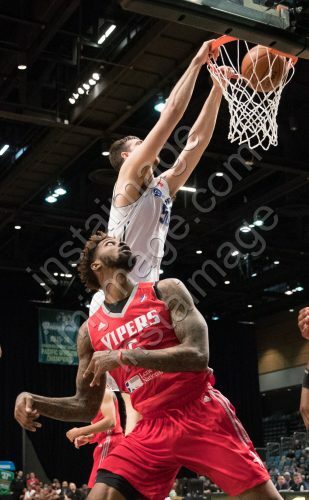 Reno Bighorn Center GEORGIOS PAPAGIANNIS (50) dunks over Rio Grande Valley Viper Forward CHRIS WALKER (5) during the NBA D-League Basketball game between the Reno Bighorns and the Rio Grande Valley Vipers at the Reno Events Center in Reno, Nevada. 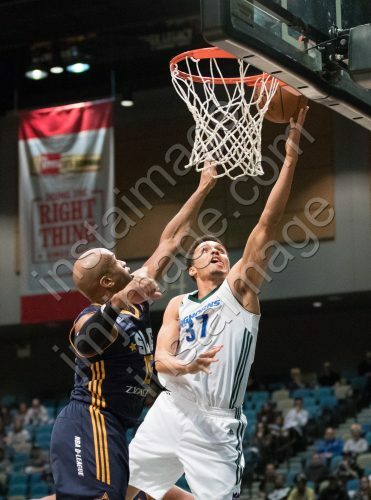 Reno Bighorn Guard ISAIAH COUSINS (10) dunks as Rio Grande Valley Viper Forward JP TOKOTO (6) watches during the NBA D-League Basketball game between the Reno Bighorns and the Rio Grande Valley Vipers at the Reno Events Center in Reno, Nevada. 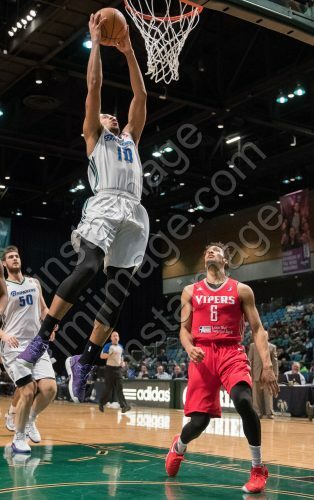 Rio Grande Valley Viper Guard DARIUS MORRIS (9) attempts a shot against Reno Bighorn Center GEORGIOS PAPAGIANNIS (50) during the NBA D-League Basketball game between the Reno Bighorns and the Rio Grande Valley Vipers at the Reno Events Center in Reno, Nevada. 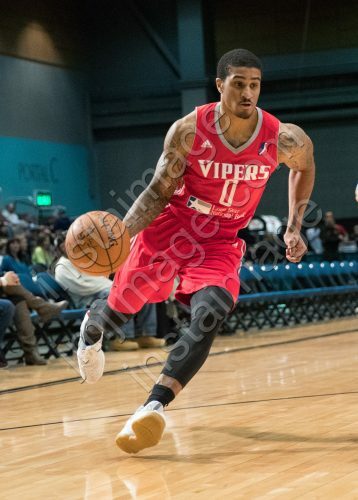 Rio Grande Valley Viper Guard GARY PAYTON II (0) drives to the hoop during the NBA D-League Basketball game between the Reno Bighorns and the Rio Grande Valley Vipers at the Reno Events Center in Reno, Nevada. 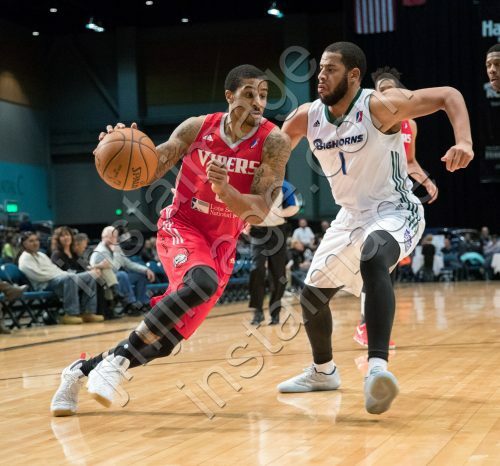 Rio Grande Valley Viper Guard GARY PAYTON II (0) drives against Reno Bighorn Guard MARK TYNDALE (1) during the NBA D-League Basketball game between the Reno Bighorns and the Rio Grande Valley Vipers at the Reno Events Center in Reno, Nevada. 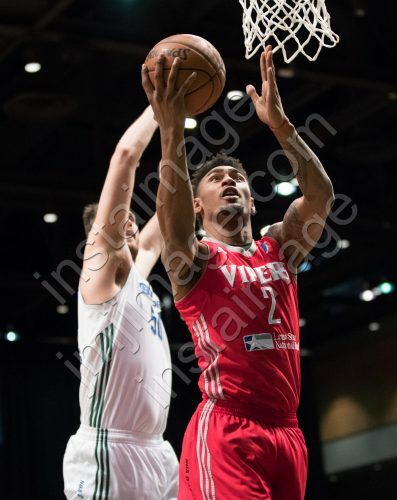 Reno Bighorn Guard ISAIAH COUSINS (10) shoots over Rio Grande Valley Viper Guard DARIUS MORRIS (9) during the NBA D-League Basketball game between the Reno Bighorns and the Rio Grande Valley Vipers at the Reno Events Center in Reno, Nevada. 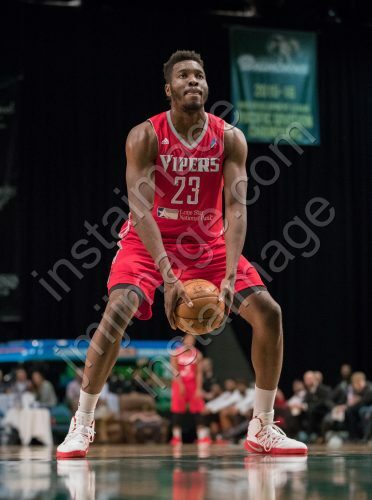 Rio Grande Valley Viper Center CHINANU ONUAKU (23) shoots an underhand free throw during the NBA D-League Basketball game between the Reno Bighorns and the Rio Grande Valley Vipers at the Reno Events Center in Reno, Nevada. 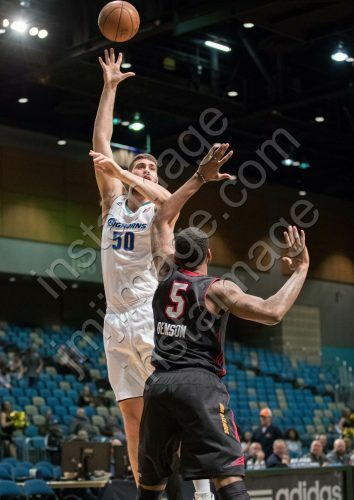 Rio Grande Valley Viper Forward LE’BRYAN NASH (2) shoots a layup against Reno Bighorn Center GEORGIOS PAPAGIANNIS (50) during the NBA D-League Basketball game between the Reno Bighorns and the Rio Grande Valley Vipers at the Reno Events Center in Reno, Nevada. 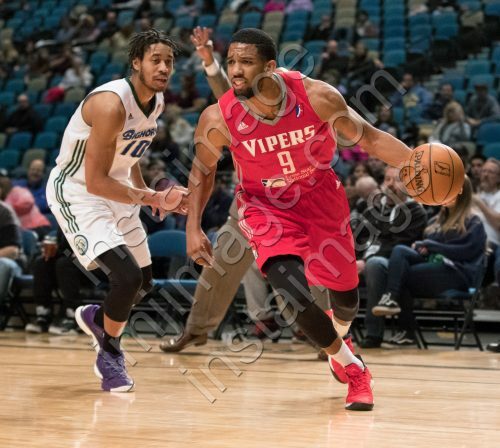 Rio Grande Valley Viper Guard DARIUS MORRIS (9) drives past Reno Bighorn Guard ISAIAH COUSINS (10) during the NBA D-League Basketball game between the Reno Bighorns and the Rio Grande Valley Vipers at the Reno Events Center in Reno, Nevada. 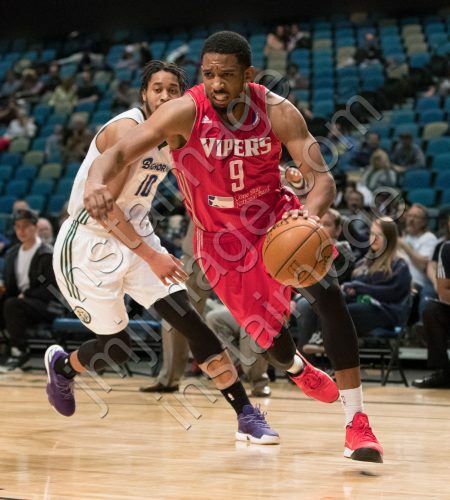 Rio Grande Valley Viper Guard DARIUS MORRIS (9) drives to the hoop during the NBA D-League Basketball game between the Reno Bighorns and the Rio Grande Valley Vipers at the Reno Events Center in Reno, Nevada. 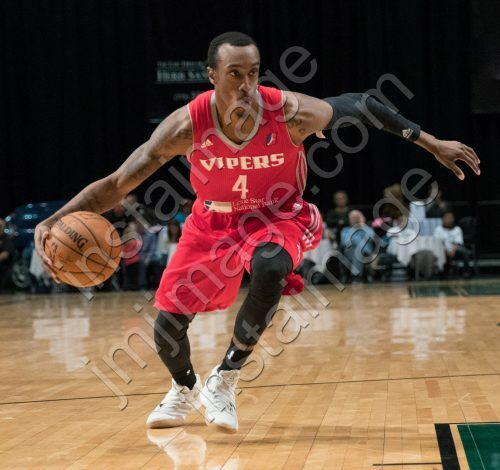 Rio Grande Valley Viper Guard JARVIS THREATT (4) starts a drive during the NBA D-League Basketball game between the Reno Bighorns and the Rio Grande Valley Vipers at the Reno Events Center in Reno, Nevada. 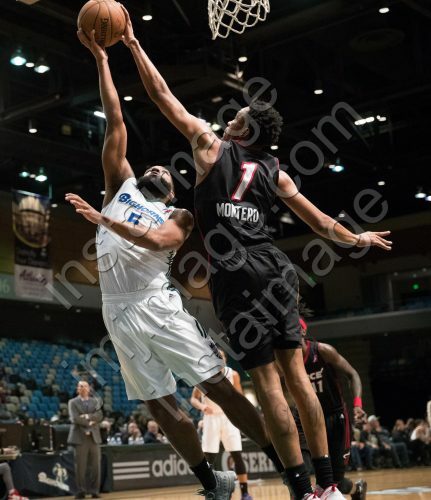 Reno Bighorn Guard ISAIAH COUSINS (10) shoots as Rio Grande Valley Viper Center CHINANU ONUAKU (23) tries to block his shot during the NBA D-League Basketball game between the Reno Bighorns and the Rio Grande Valley Vipers at the Reno Events Center in Reno, Nevada. 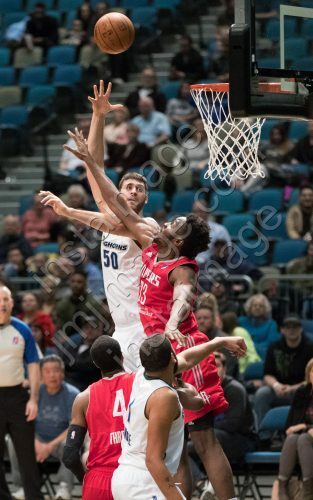 Reno Bighorn Center GEORGIOS PAPAGIANNIS (50) shoots over Rio Grande Valley Viper Center CHINANU ONUAKU (23) during the NBA D-League Basketball game between the Reno Bighorns and the Rio Grande Valley Vipers at the Reno Events Center in Reno, Nevada. 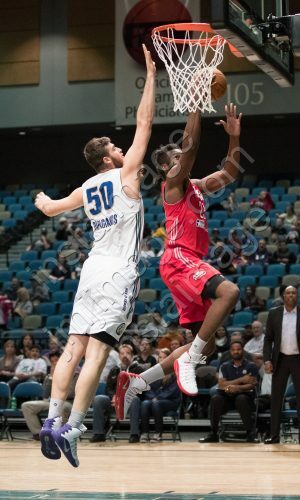 Rio Grande Valley Viper Center CHINANU ONUAKU (23) attempts a shot against Reno Bighorn Center GEORGIOS PAPAGIANNIS (50) during the NBA D-League Basketball game between the Reno Bighorns and the Rio Grande Valley Vipers at the Reno Events Center in Reno, Nevada. 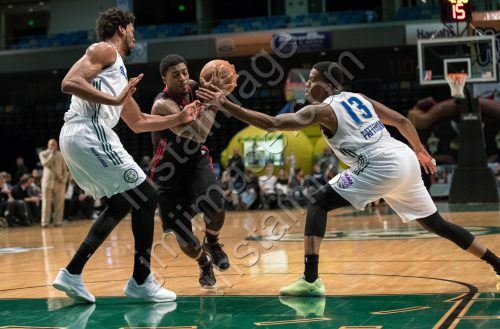 RENO, Nev. —- The Reno Bighorns (11-17) fell to the Rio Grande Valley Vipers (17-12) 119-114 Friday night at the Reno Events Center. 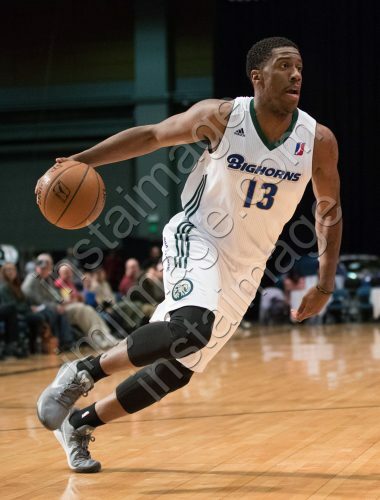 Sacramento Kings Affiliate Player Lamar Patterson led the Bighorns with 39 points and seven rebounds while affiliate player Isiah Cousins notched 22 points, five rebounds and eight assists. Kings assignment player Georgios Papagiannis recorded his fourth double-double of the season 17 points and 12 rebounds. Darius Morrris paced the Vipers with 27 points, five rebounds and five assists while Chinanu Onuaku had 19 points and 11 rebounds. The opening quarter was a fast-paced, tightly contested play in which neither team led by more than six points. Patterson led all scorers in the first frame with 13 points, helping the Bighorns to a one-point advantage to start the second frame. The head-to-head battle carried through to a high-scoring frame with Reno and Rio Grande Valley both scoring over 29 points. The Bighorns led by as many as eight points, despite the frame seeing eight lead changes and four ties. 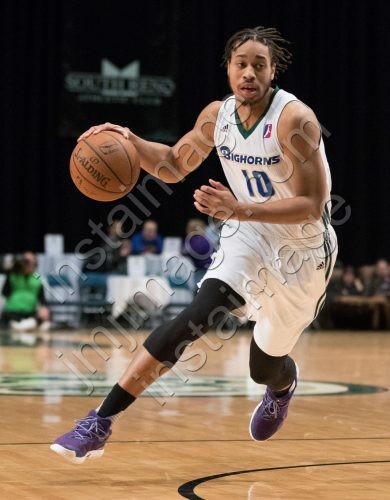 The Bighorns led the Vipers 61-57 at the half. 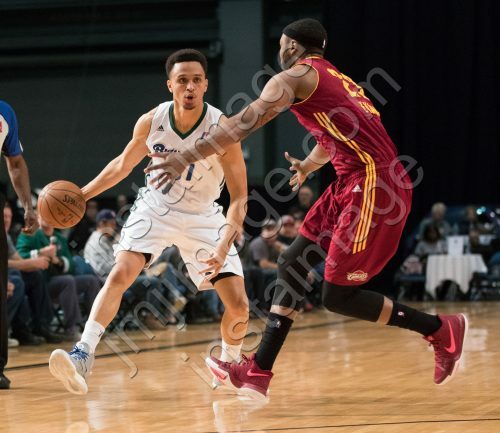 The Bighorns held a double-digit lead over at the 8:00 mark until the Vipers went on a late rally to leave the Bighorns trailing by one point to end the third period. The Bighorns held the upper hand on the Vipers to open the final frame after six points from Patterson in the first minute and a half of play. The Vipers retook control of the lead after two lay-ups from Jarvis Threatt and a lay-up from Walker. Despite Patterson scoring 13 points in the final frame, the Vipers would not relinquish the lead. The Bighorns will return to the Reno Events Center on Sunday, Jan. 29 to host the Salt Lake City Stars at 5 p.m. The Kings entertainment team will join the Bighorns for affiliate games in Reno during the January 29 contest. Kings Legends, Sacramento Kings Dancers, Mascot Slamson and more will be on hand to give fans in Reno an opportunity to connect directly with the Sacramento organization. 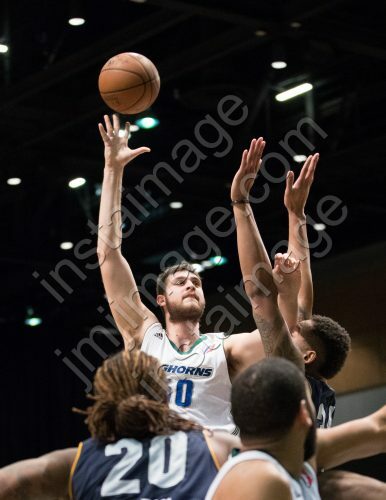 Reno Bighorn Center GEORGIOS PAPAGIANNIS (50) shoots over Sioux Falls Skyforce Center KEITH BENSON (5) during the NBA D-League Basketball game between the Reno Bighorns and the Sioux Falls Skyforce at the Reno Events Center in Reno, Nevada. Reno Bighorn Guard LAMAR PATTERSON (13) shoots against Sioux Falls Skyforce Center KEITH BENSON (5) with Sioux Falls Skyforce Forward STEFAN JANKOVIC (3) watching during the NBA D-League Basketball game between the Reno Bighorns and the Sioux Falls Skyforce at the Reno Events Center in Reno, Nevada. 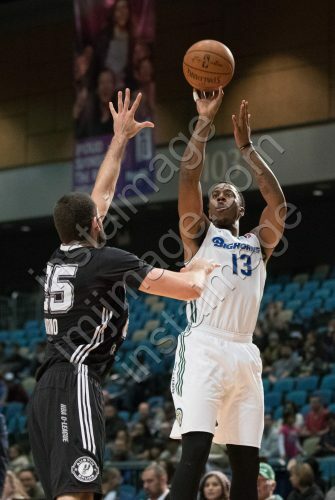 Reno Bighorn Guard LAMAR PATTERSON (13) drives against Sioux Falls Skyforce Guard PATRICK MILLER (7) during the NBA D-League Basketball game between the Reno Bighorns and the Sioux Falls Skyforce at the Reno Events Center in Reno, Nevada. Reno Bighorn Guard LAMAR PATTERSON (13) drives through Sioux Falls Skyforce Guard PATRICK MILLER (7) and Sioux Falls Skyforce Guard BRIANTE WEBER (11) during the NBA D-League Basketball game between the Reno Bighorns and the Sioux Falls Skyforce at the Reno Events Center in Reno, Nevada. 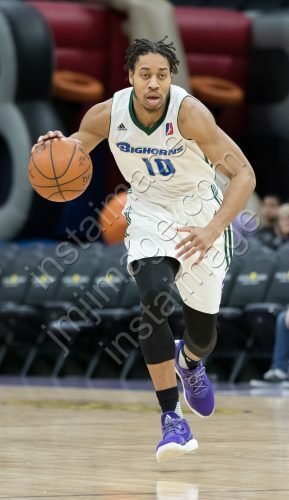 Reno Bighorn Guard ISAIAH COUSINS (10) during the NBA D-League Basketball game between the Reno Bighorns and the Sioux Falls Skyforce at the Reno Events Center in Reno, Nevada. Reno Bighorn Guard ISAIAH COUSINS (10) shoots over Sioux Falls Skyforce Center KEITH BENSON (5) with Sioux Falls Skyforce Guard LUIS MONTERO (1) watching during the NBA D-League Basketball game between the Reno Bighorns and the Sioux Falls Skyforce at the Reno Events Center in Reno, Nevada. 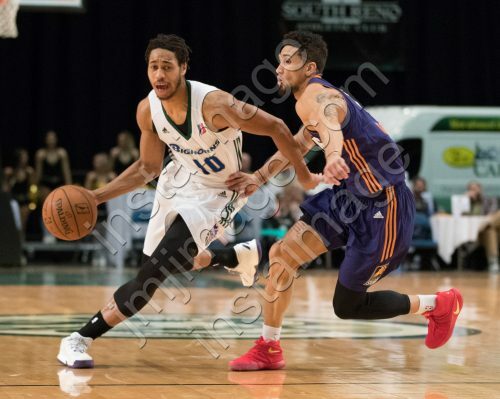 Reno Bighorn Guard ISAIAH COUSINS (10) drives against Sioux Falls Skyforce Guard LUIS MONTERO (1) during the NBA D-League Basketball game between the Reno Bighorns and the Sioux Falls Skyforce at the Reno Events Center in Reno, Nevada. 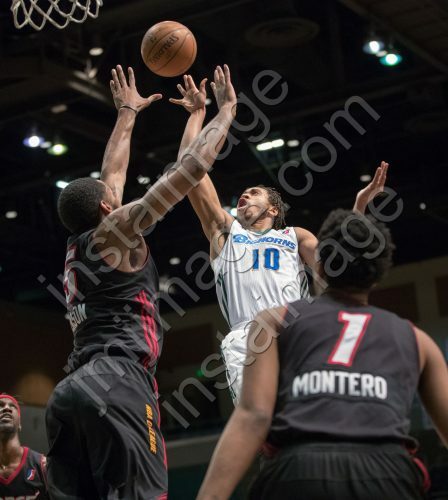 Sioux Falls Skyforce Guard LUIS MONTERO (1) blocks a shot by Reno Bighorn Guard PE’SHON HOWARD (5) during the NBA D-League Basketball game between the Reno Bighorns and the Sioux Falls Skyforce at the Reno Events Center in Reno, Nevada. 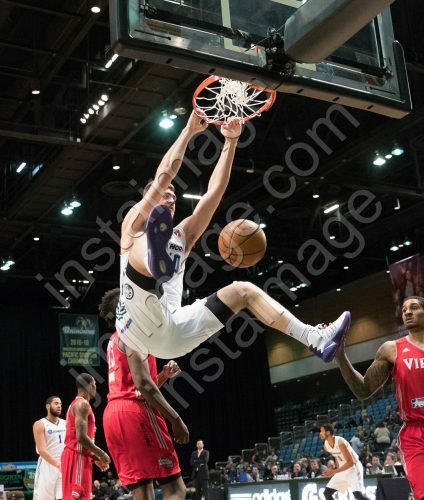 Reno Bighorn Center GEORGIOS PAPAGIANNIS (50) dunks during the NBA D-League Basketball game between the Reno Bighorns and the Sioux Falls Skyforce at the Reno Events Center in Reno, Nevada. 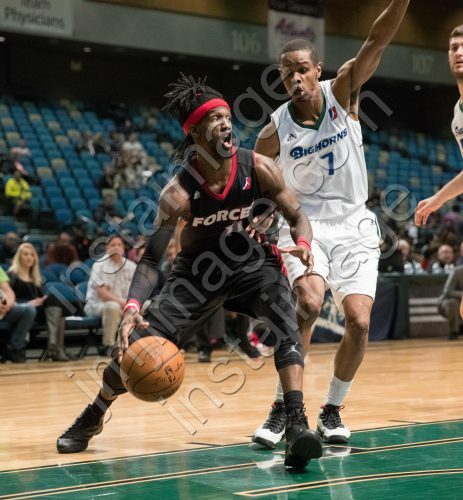 Sioux Falls Skyforce Guard BRIANTE WEBER (11) drives against Reno Bighorn Guard RENALDO MAJOR (7) during the NBA D-League Basketball game between the Reno Bighorns and the Sioux Falls Skyforce at the Reno Events Center in Reno, Nevada. 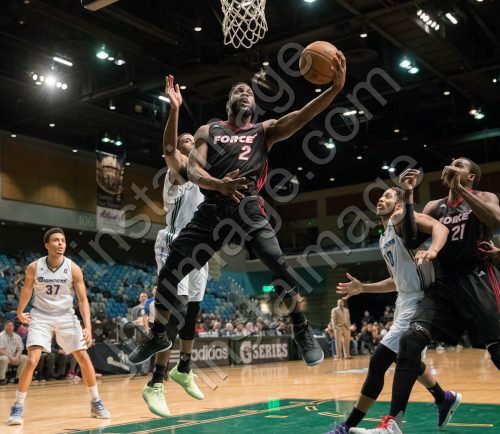 Sioux Falls Skyforce Guard IKE NWAMU (2) flies to the hoop against Reno Bighorn Guard LAMAR PATTERSON (13) during the NBA D-League Basketball game between the Reno Bighorns and the Sioux Falls Skyforce at the Reno Events Center in Reno, Nevada. 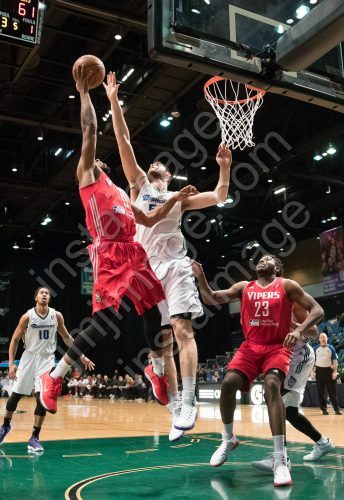 Reno Bighorn Guard REGGIE HEARN (37) pulls down a rebound against Sioux Falls Skyforce Forward STEFAN JANKOVIC (3) during the NBA D-League Basketball game between the Reno Bighorns and the Sioux Falls Skyforce at the Reno Events Center in Reno, Nevada. Reno Bighorn Guard REGGIE HEARN (37) and Reno Bighorn Guard RENALDO MAJOR (7) gather with Bruno the Bighorn for a short prayer after the NBA D-League Basketball game between the Reno Bighorns and the Sioux Falls Skyforce at the Reno Events Center in Reno, Nevada. Reno Bighorn Guard LAMAR PATTERSON (13) gets a pick from Reno Bighorn Center GEORGIOS PAPAGIANNIS (50) on Sioux Falls Skyforce Guard LUIS MONTERO (1) and drives to the key during the NBA D-League Basketball game between the Reno Bighorns and the Sioux Falls Skyforce at the Reno Events Center in Reno, Nevada. 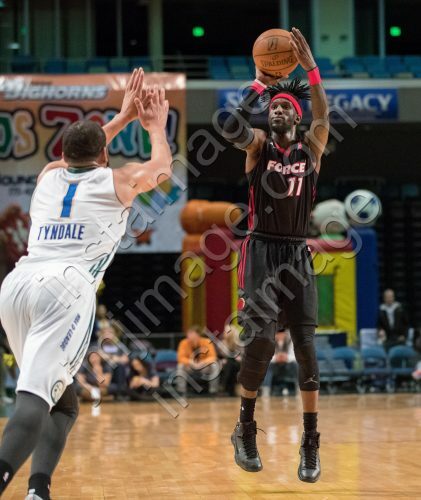 Sioux Falls Skyforce Guard BRIANTE WEBER (11) pulls up for a quick three against Reno Bighorn Guard MARK TYNDALE (1) during the NBA D-League Basketball game between the Reno Bighorns and the Sioux Falls Skyforce at the Reno Events Center in Reno, Nevada. 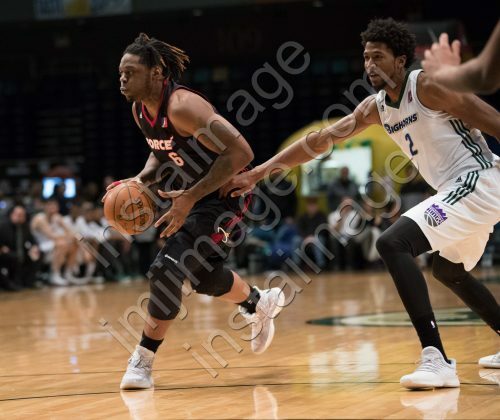 Sioux Falls Skyforce Guard HENRY WALKER (6) drives past Reno Bighorn Forward KADEEM JACK (2) during the NBA D-League Basketball game between the Reno Bighorns and the Sioux Falls Skyforce at the Reno Events Center in Reno, Nevada. Sioux Falls Skyforce Forward STEFAN JANKOVIC (3) passes the ball with Reno Bighorn Forward KADEEM JACK (2) stepping up and Reno Bighorn Guard MARK TYNDALE (1) following during the NBA D-League Basketball game between the Reno Bighorns and the Sioux Falls Skyforce at the Reno Events Center in Reno, Nevada. Sioux Falls Skyforce Guard BRIANTE WEBER (11) tries to draw a foul against Reno Bighorn Forward KADEEM JACK (2) during the NBA D-League Basketball game between the Reno Bighorns and the Sioux Falls Skyforce at the Reno Events Center in Reno, Nevada. 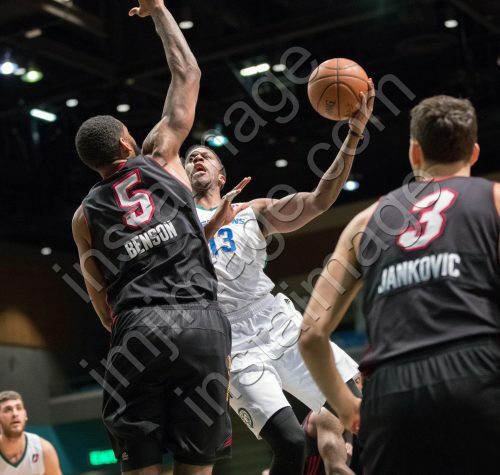 Sioux Falls Skyforce Guard PATRICK MILLER (7) drives against Reno Bighorn Forward KADEEM JACK (2) and Reno Bighorn Guard LAMAR PATTERSON (13) during the NBA D-League Basketball game between the Reno Bighorns and the Sioux Falls Skyforce at the Reno Events Center in Reno, Nevada. 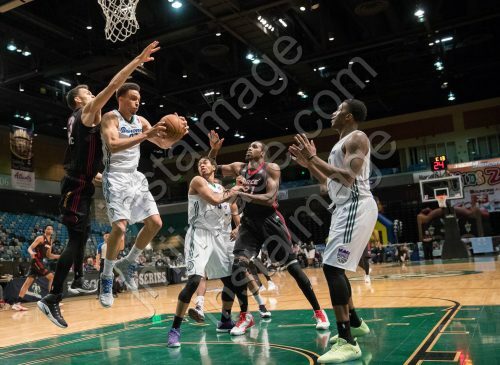 Sioux Falls Skyforce Guard PATRICK MILLER (7) drives during the NBA D-League Basketball game between the Reno Bighorns and the Sioux Falls Skyforce at the Reno Events Center in Reno, Nevada. 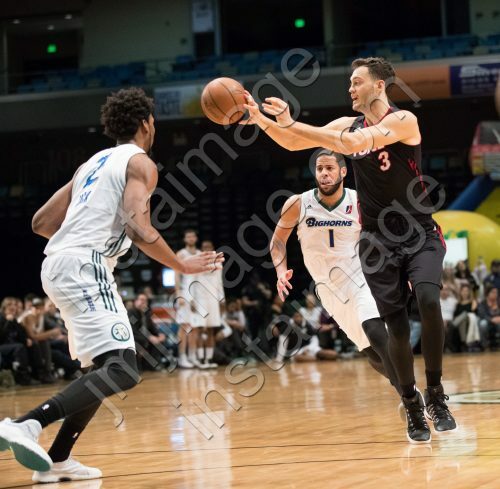 RENO, Nev. —- The Reno Bighorns (11-16) defeated the Sioux Falls Skyforce (20-7) 129-116 Wednesday night at the Reno Events Center. 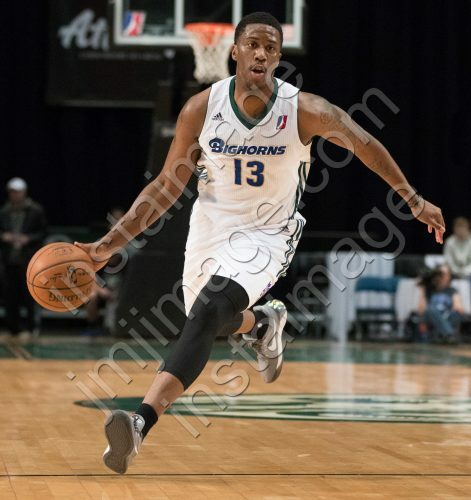 Sacramento Kings Affiliate Player Lamar Patterson led the Bighorns with a season-high 41 points while adding six rebounds and four assists while assignment player Isiah Cousins logged a double-double with 27 points and 11 rebounds. Kings assignment player Georgios Papagiannis recorded his third double-double of the season with 25 points and 15 rebounds. 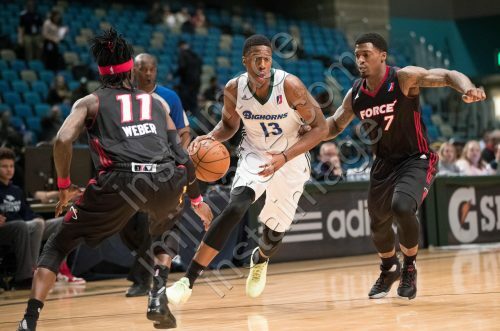 Briante Weber paced the Skyforce with 34 points, seven rebounds and five assists while Keith Benson had 24 points and eight rebounds. The Skyforce took control of the lead early, leading by more than five in the opening half of the first quarter before the Bighorns went on a 16-3 run to hold a 10-point advantage over the Skyforce with 2:22 left in play. The Skyforce went on a late 12-4 run to trail the Bighorns 28-26 heading into the second frame. 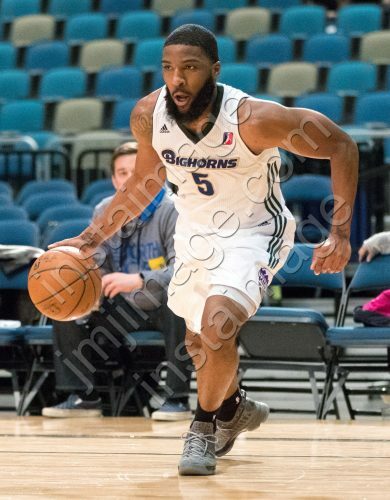 The momentum remained with the Bighorns to begin the second period with a 16-5 run behind a triple from Patterson to open their lead to as many as 13 points by the 7:23 mark. The Skyforce rallied back to retake control of the lead with 1:31 left to play in the first half. A floating jumper by Weber and two free-throws from Marcus Posley would give the Skyforce a 58-55 lead with under a minute in play. Cousins stepped to the line after being fouled by Weber to make two points to edge the Skyforce by one. 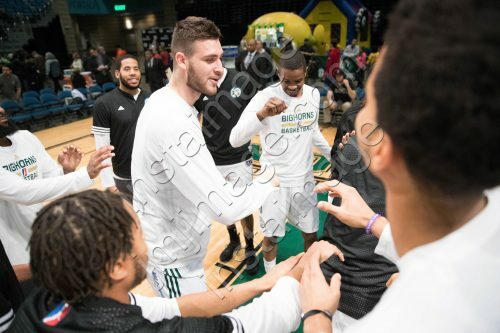 Papagiannis sunk a three with .3 left in play in the first half to give the Bighorns the lead that would not be relinquished for the remainder of the game. 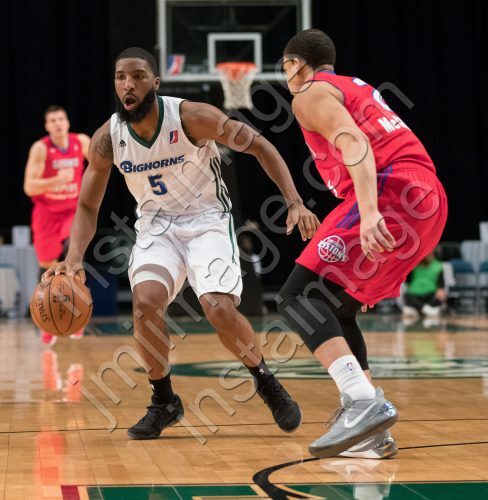 The Bighorns went into the locker room at the half leading 62-60. Patterson, Papagiannis and Cousins combined for a total of 57 points in the first half. 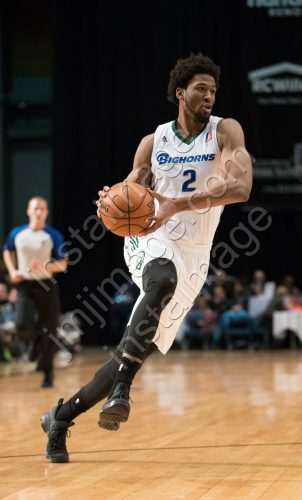 The Bighorns dominated the third frame, outscoring the Skyforce 36-25 to lead by as many at 13 points. The teams remained scoreless the first two minutes of the fourth quarter before Skyforce’s Miller made a lay-up at the 10:00 mark. 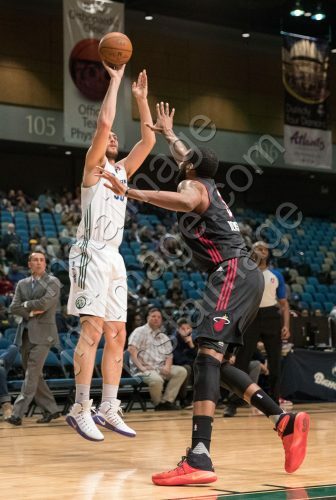 The Bighorns responded with a three and two free throws from Cousins to open the Bighorns’ lead to 17. 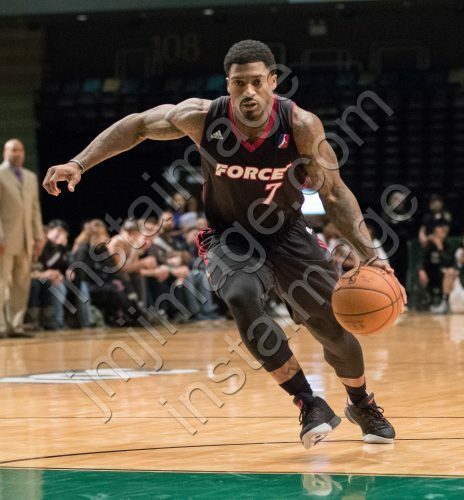 The Skyforce would get within 10-points of the Bighorns with 3:26 to play before the Bighorns ran away with the lead to secure a 129-116 victory over the Skyforce. 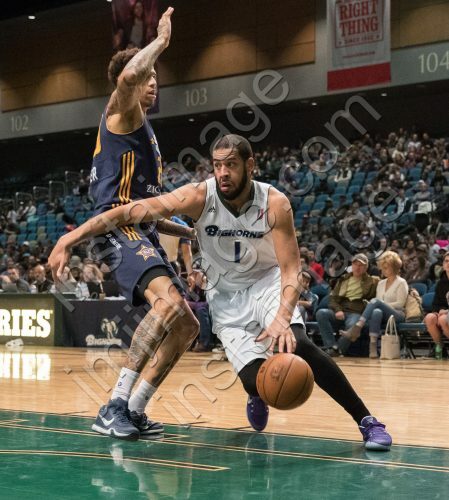 The Bighorns will return to the Reno Events Center on Friday, Jan. 27 to host the Rio Grande Valley Vipers at 7 pm. 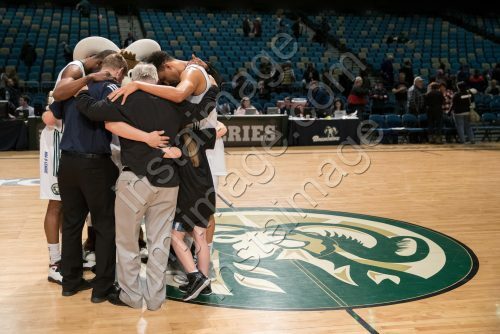 The Reno Bighorns huddle before the NBA D-League Basketball game between the Reno Bighorns and the Canton Charge at the Reno Events Center in Reno, Nevada. 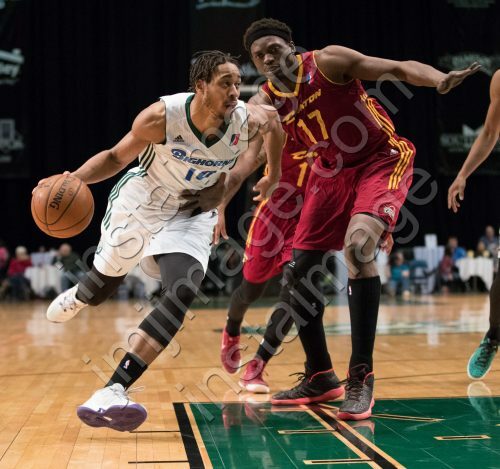 Reno Bighorn Guard ISAIAH COUSINS (10) during the NBA D-League Basketball game between the Reno Bighorns and the Canton Charge at the Reno Events Center in Reno, Nevada. 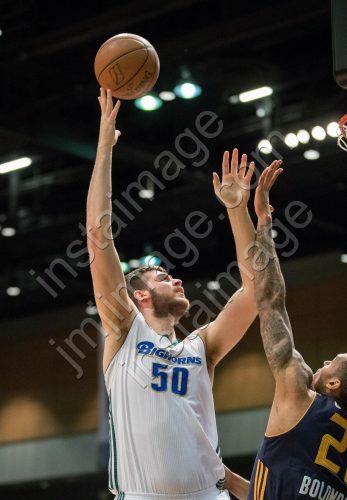 Reno Bighorn Center GEORGIOS PAPAGIANNIS (50) during the NBA D-League Basketball game between the Reno Bighorns and the Canton Charge at the Reno Events Center in Reno, Nevada. Reno Bighorn Guard MARK TYNDALE (1) drives against Canton Charge Guard ROOSEVELT JONES (21) during the NBA D-League Basketball game between the Reno Bighorns and the Canton Charge at the Reno Events Center in Reno, Nevada. 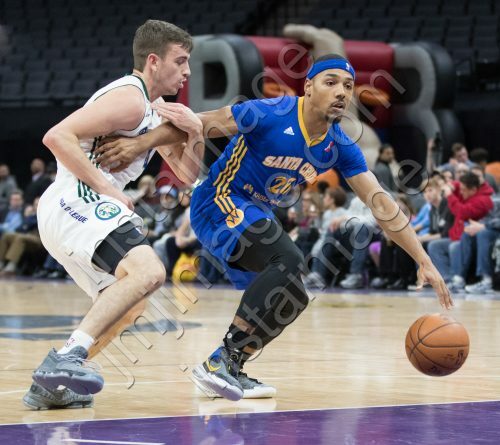 Reno Bighorn Guard REGGIE HEARN (37) drives against Canton Charge Forward CHRIS EVANS (23) during the NBA D-League Basketball game between the Reno Bighorns and the Canton Charge at the Reno Events Center in Reno, Nevada. 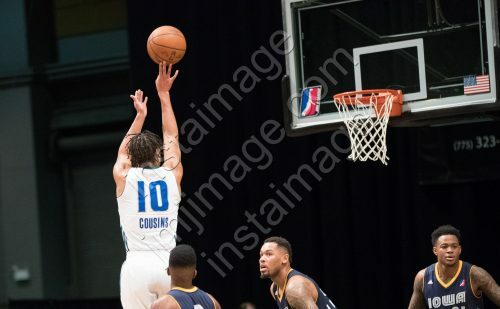 Reno Bighorn Guard ISAIAH COUSINS (10) shoots against Canton Charge Guard JOHN HOLLAND (11) during the NBA D-League Basketball game between the Reno Bighorns and the Canton Charge at the Reno Events Center in Reno, Nevada. 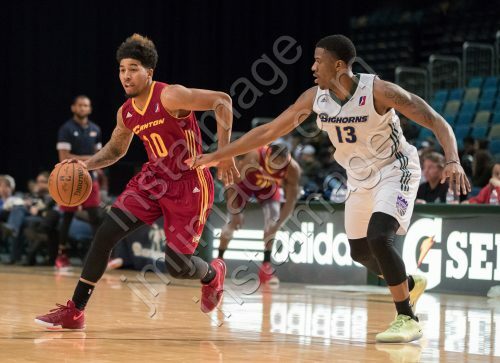 Reno Bighorn Guard ISAIAH COUSINS (10) drives against Canton Charge Guard QUINN COOK (2) during the NBA D-League Basketball game between the Reno Bighorns and the Canton Charge at the Reno Events Center in Reno, Nevada. 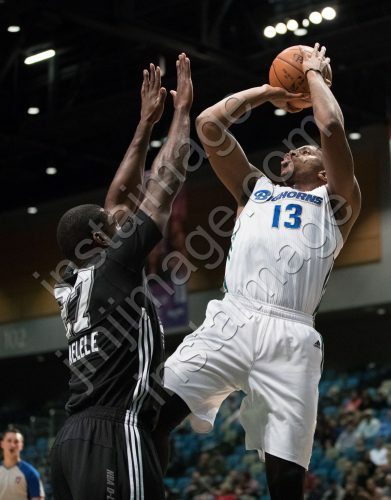 Reno Bighorn Guard LAMAR PATTERSON (13) shoots against Canton Charge Guard JOHN HOLLAND (11) during the NBA D-League Basketball game between the Reno Bighorns and the Canton Charge at the Reno Events Center in Reno, Nevada. 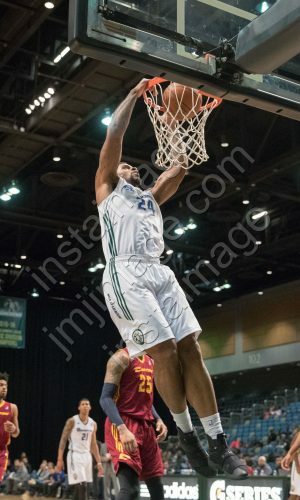 Reno Bighorn Forward CHANE BEHANAN (24) dunks during the NBA D-League Basketball game between the Reno Bighorns and the Canton Charge at the Reno Events Center in Reno, Nevada. 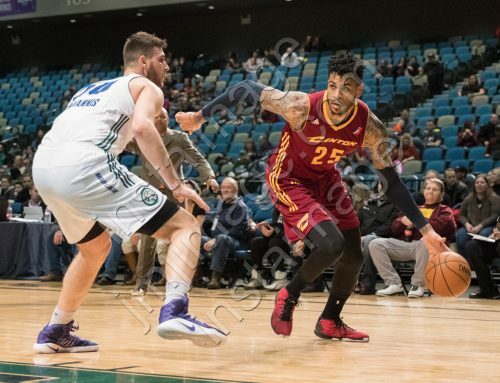 Reno Bighorn Forward CHANE BEHANAN (24) drives past Canton Charge Forward CHRIS EVANS (23) during the NBA D-League Basketball game between the Reno Bighorns and the Canton Charge at the Reno Events Center in Reno, Nevada. 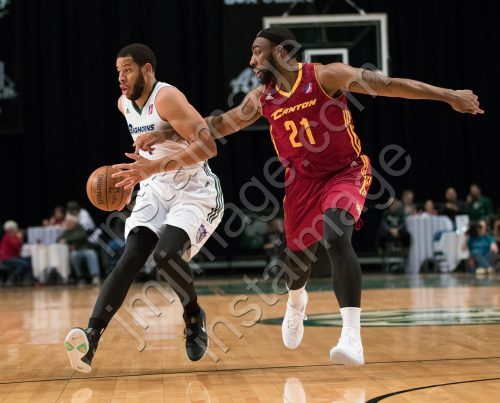 Canton Charge Forward ERIC MORELAND (25) drives past Reno Bighorn Center GEORGIOS PAPAGIANNIS (50) during the NBA D-League Basketball game between the Reno Bighorns and the Canton Charge at the Reno Events Center in Reno, Nevada. Reno Bighorn Guard LAMAR PATTERSON (13) during the NBA D-League Basketball game between the Reno Bighorns and the Canton Charge at the Reno Events Center in Reno, Nevada. 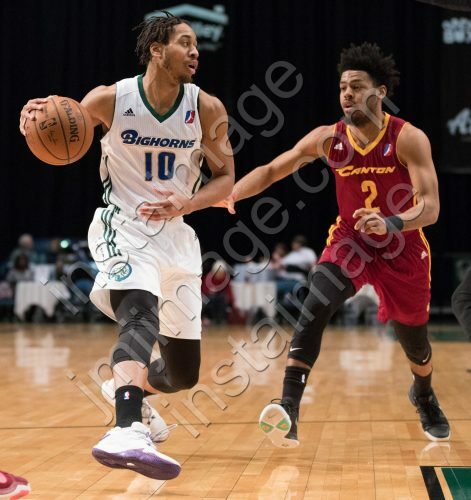 Reno Bighorn Guard ISAIAH COUSINS (10) drives past Canton Charge Center MICHAEL DUNIGAN (17) during the NBA D-League Basketball game between the Reno Bighorns and the Canton Charge at the Reno Events Center in Reno, Nevada. Reno Bighorn Guard MARK TYNDALE (1) drives against Canton Charge Forward ERIC MORELAND (25) during the NBA D-League Basketball game between the Reno Bighorns and the Canton Charge at the Reno Events Center in Reno, Nevada. 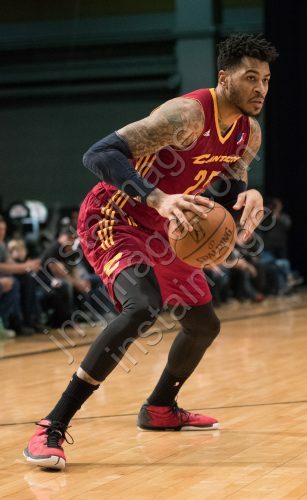 Canton Charge Forward ERIC MORELAND (25) during the NBA D-League Basketball game between the Reno Bighorns and the Canton Charge at the Reno Events Center in Reno, Nevada. 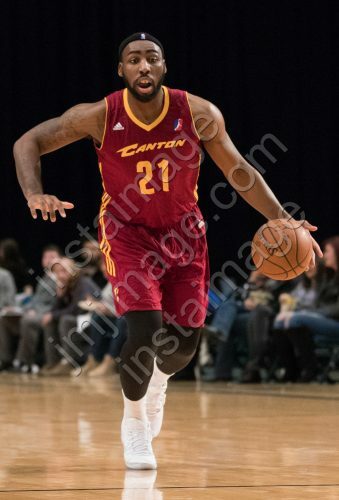 Canton Charge Guard ROOSEVELT JONES (21) during the NBA D-League Basketball game between the Reno Bighorns and the Canton Charge at the Reno Events Center in Reno, Nevada. 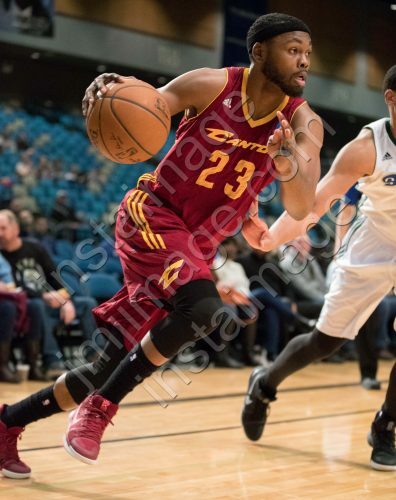 Canton Charge Forward CHRIS EVANS (23) during the NBA D-League Basketball game between the Reno Bighorns and the Canton Charge at the Reno Events Center in Reno, Nevada. 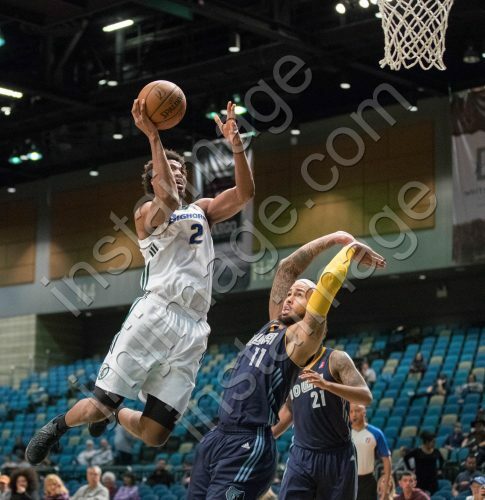 Canton Charge Center MICHAEL DUNIGAN (17) works against Reno Bighorn Forward WILL DAVIS II (0) during the NBA D-League Basketball game between the Reno Bighorns and the Canton Charge at the Reno Events Center in Reno, Nevada. 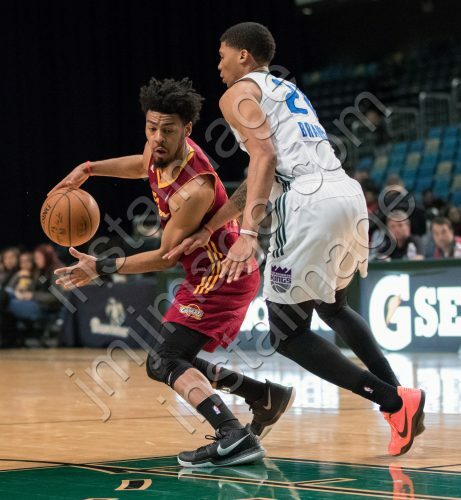 Canton Charge Guard QUINN COOK (2) works against Reno Bighorn Guard JAMAL BRANCH (21) during the NBA D-League Basketball game between the Reno Bighorns and the Canton Charge at the Reno Events Center in Reno, Nevada. 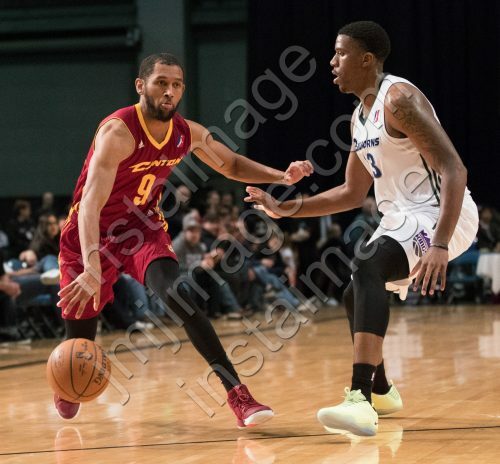 Canton Charge Guard JUSTIN JOHNSON (9) drives against Reno Bighorn Guard LAMAR PATTERSON (13) during the NBA D-League Basketball game between the Reno Bighorns and the Canton Charge at the Reno Events Center in Reno, Nevada. 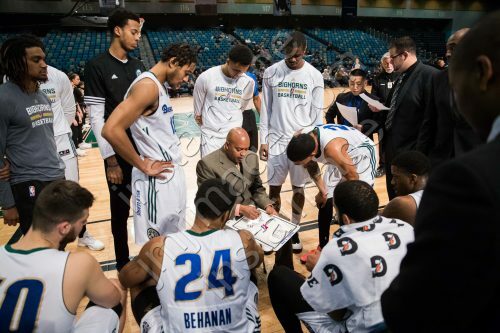 The Reno Bighorns during a timeout of the NBA D-League Basketball game between the Reno Bighorns and the Canton Charge at the Reno Events Center in Reno, Nevada. 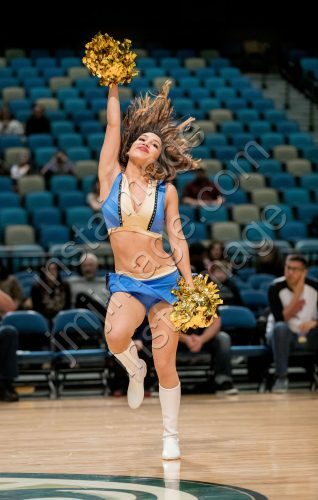 The Reno Lady Bighorn Dancers perform during the NBA D-League Basketball game between the Reno Bighorns and the Canton Charge at the Reno Events Center in Reno, Nevada. 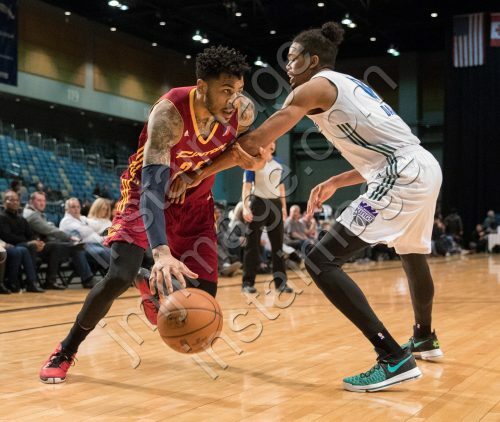 Canton Charge Forward ERIC MORELAND (25) drives against Reno Bighorn Forward WILL DAVIS II (0) during the NBA D-League Basketball game between the Reno Bighorns and the Canton Charge at the Reno Events Center in Reno, Nevada. 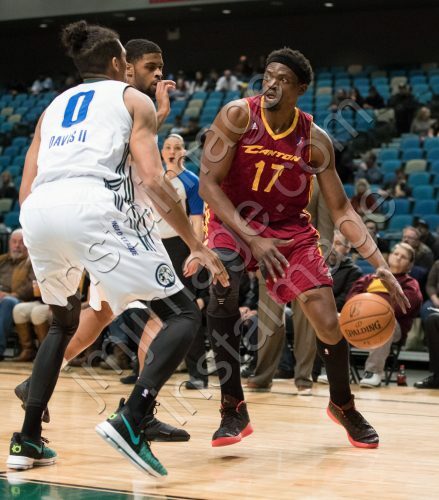 Canton Charge Guard MIKE WILLIAMS (10) drives against Reno Bighorn Guard LAMAR PATTERSON (13) during the NBA D-League Basketball game between the Reno Bighorns and the Canton Charge at the Reno Events Center in Reno, Nevada. 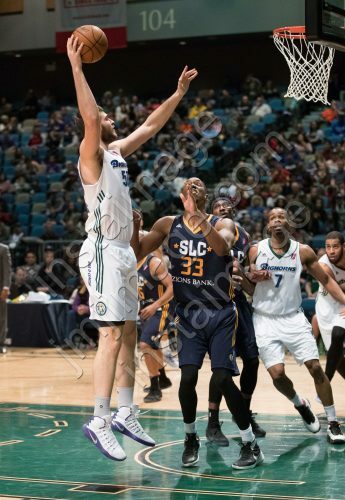 Reno, Nev. —- The Reno Bighorns (9-14) fell to the Canton Charge (13-9) 129-105 Friday night at the Reno Events Center. 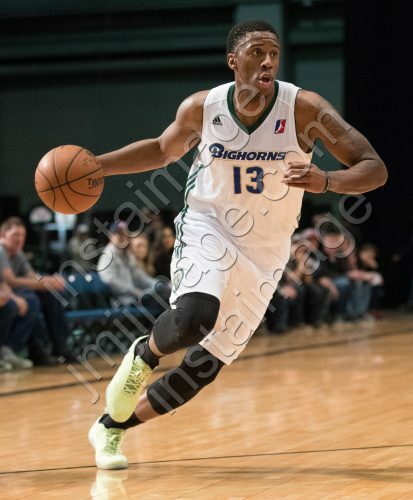 Sacramento Kings Affiliate Player Lamar Patterson led the Bighorns with a team-high 36 points (.563 FG%, .500 3p%) while adding six rebounds and three assists. 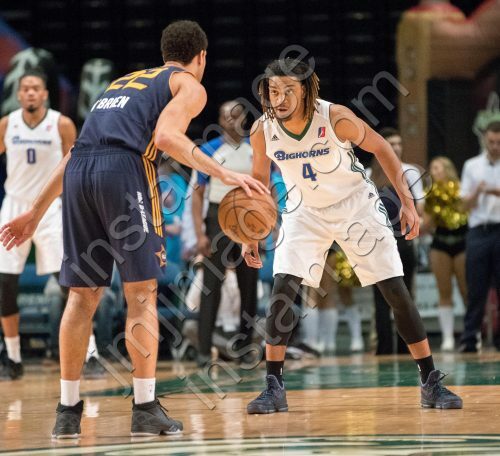 Affiliate player Isaiah Cousins scored 21 points and added four rebounds, seven assists and four steals while Reggie Hearn totaled 12 points and three assists. Michael Dunigan paced the Charge with 20 points, five rebounds and two assists while John Holland notched 19 points, three rebounds and four assists. 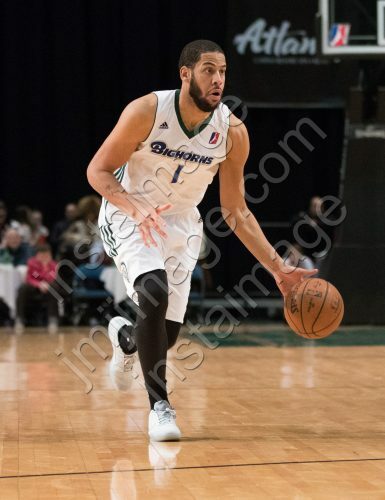 The Bighorns jumped out to an early 12-4 lead in the first quarter behind triples from Hearn and Patterson. 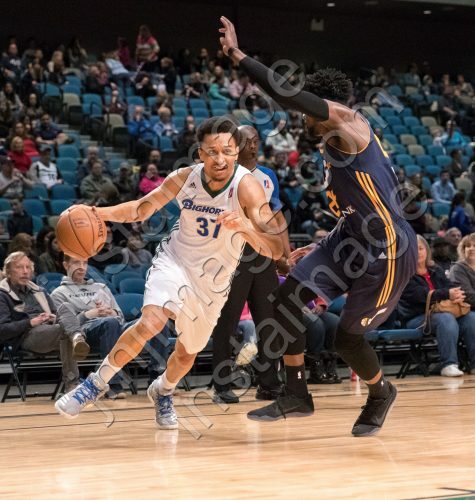 The Charge battled back to get within three points of the Bighorns before the Bighorns went on a 8-0 run to lead the Charge by 11 at the mid-way point. The Bighorns kept the Charge at bay to hold a 38-32 lead heading into the second frame. Patterson and Cousins combined for a total of 25 points in the first quarter. 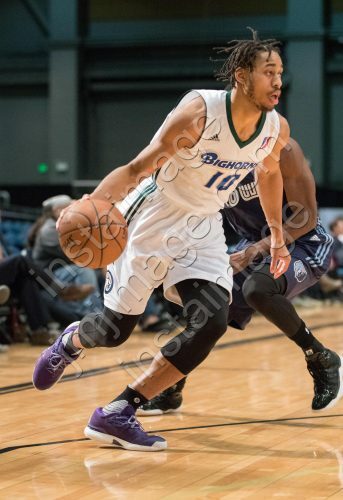 After two free throws and a lay-up from Patterson to open the second frame, the Bighorns held an 8-point advantage over the Charge before Canton went on an 14-4 run to knot the game up at 46 at the 7:44 mark. The teams remained scoreless for two minutes until Charge’s Moreland stepped to the line to make two free-throws to take control of the lead. The Charge closed out the frame going on an 18-6 run to go into the locker room at the half leading the Bighorns 66-52. The Charge heated up coming out of the break, leading by as many as 20 points in the third quarter. 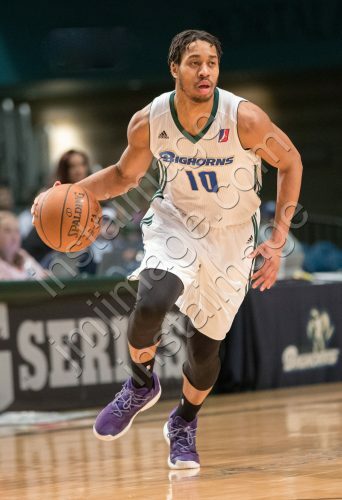 The Bighorns would never reclaim the advantage in the second half, falling 129-105. Patterson scored 19 of his 36 points in the second half. 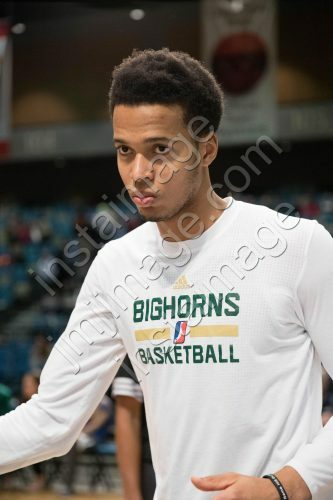 The Game Face from Reno Bighorn Center SKAL LABISSIERE (19) before the NBA D-League Basketball game between the Reno Bighorns and the Austin Spurs at the Reno Events Center in Reno, Nevada. 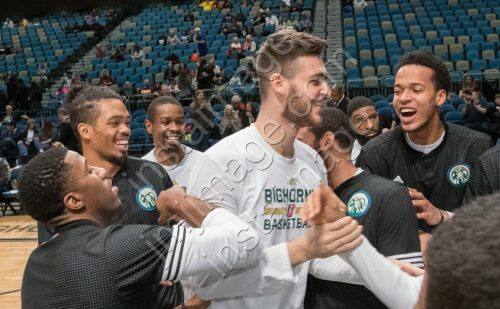 The pregame Reno Bighorn Ritual with Reno Bighorn Center GEORGE PAPAGIANNIS (50) during the NBA D-League Basketball game between the Reno Bighorns and the Austin Spurs at the Reno Events Center in Reno, Nevada. 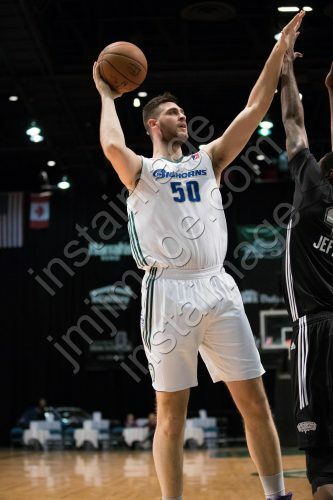 Reno Bighorn Center GEORGE PAPAGIANNIS (50) shoots over Austin Spurs Forward CORY JEFFERSON (40) during the NBA D-League Basketball game between the Reno Bighorns and the Austin Spurs at the Reno Events Center in Reno, Nevada. 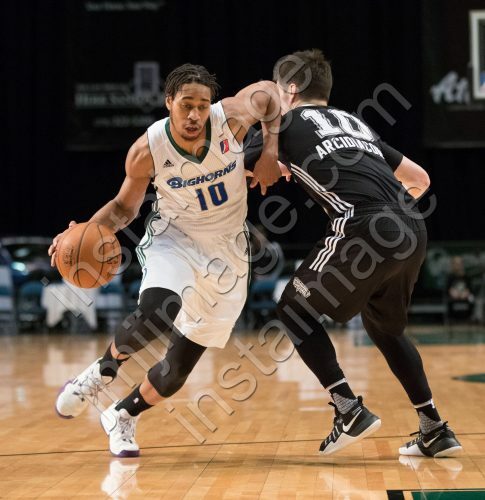 Reno Bighorn Guard ISAIAH COUSINS (10) drives past Austin Spurs Guard RYAN ARCIDIACONO (10) during the NBA D-League Basketball game between the Reno Bighorns and the Austin Spurs at the Reno Events Center in Reno, Nevada. 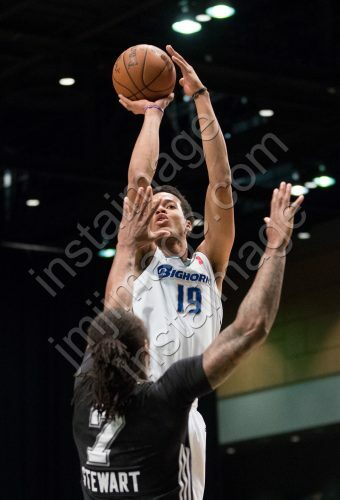 Reno Bighorn Center SKAL LABISSIERE (19) shoots over Austin Spurs Forward DANNY STEWART (7) during the NBA D-League Basketball game between the Reno Bighorns and the Austin Spurs at the Reno Events Center in Reno, Nevada. Reno Bighorn Guard LAMAR PATTERSON (13) shoots over Austin Spurs Forward PATRICIO GARINO (25) during the NBA D-League Basketball game between the Reno Bighorns and the Austin Spurs at the Reno Events Center in Reno, Nevada. Reno Bighorn Center GEORGE PAPAGIANNIS (50) shoots a fadeaway against Austin Spurs Forward CHARLES GARCIA (33) during the NBA D-League Basketball game between the Reno Bighorns and the Austin Spurs at the Reno Events Center in Reno, Nevada. 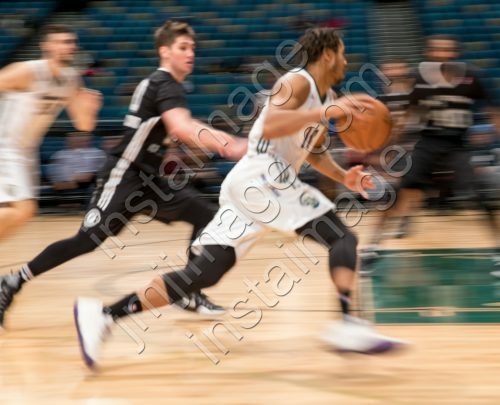 Reno Bighorn Guard ISAIAH COUSINS (10) streaks to the basket against Austin Spurs Guard RYAN ARCIDIACONO (10) during the NBA D-League Basketball game between the Reno Bighorns and the Austin Spurs at the Reno Events Center in Reno, Nevada. Reno Bighorn Guard LAMAR PATTERSON (13) shoots over Austin Spurs Guard DANIEL NWAELELE (27) during the NBA D-League Basketball game between the Reno Bighorns and the Austin Spurs at the Reno Events Center in Reno, Nevada. Reno Bighorn Center GEORGE PAPAGIANNIS (50) shoots over Austin Spurs Forward CHARLES GARCIA (33) during the NBA D-League Basketball game between the Reno Bighorns and the Austin Spurs at the Reno Events Center in Reno, Nevada. 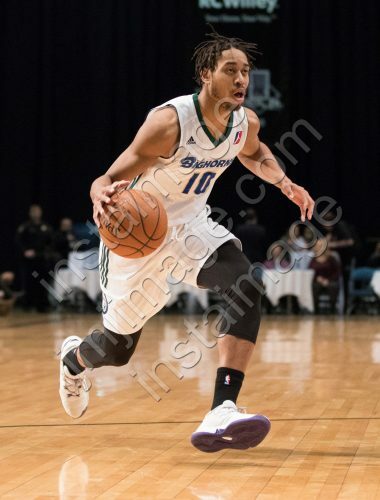 Reno Bighorn Guard ISAIAH COUSINS (10) during the NBA D-League Basketball game between the Reno Bighorns and the Austin Spurs at the Reno Events Center in Reno, Nevada. 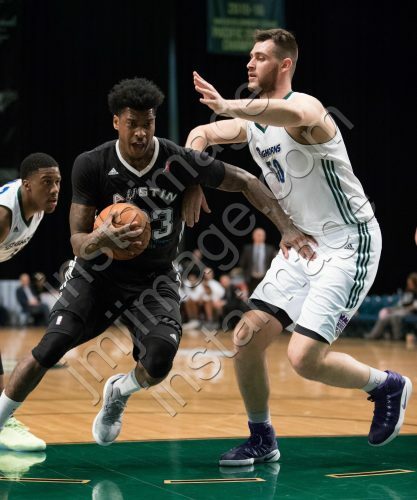 Reno Bighorn Forward WILL DAVIS II (0) drives against Austin Spurs Forward CHARLES GARCIA (33) during the NBA D-League Basketball game between the Reno Bighorns and the Austin Spurs at the Reno Events Center in Reno, Nevada. 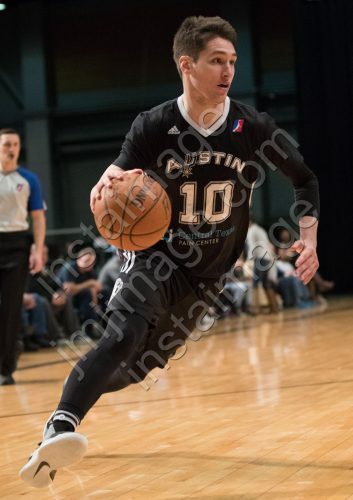 Austin Spurs Guard RYAN ARCIDIACONO (10) during the NBA D-League Basketball game between the Reno Bighorns and the Austin Spurs at the Reno Events Center in Reno, Nevada. 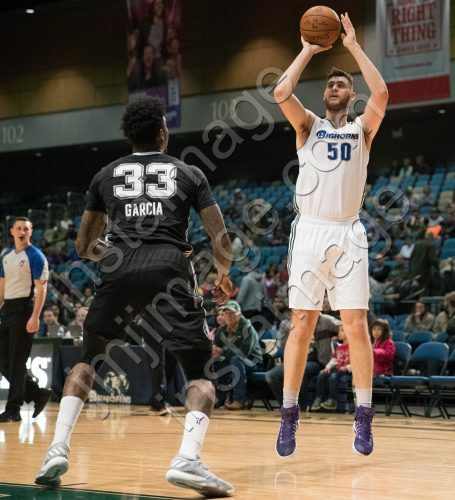 Austin Spurs Forward CHARLES GARCIA (33) drives against Reno Bighorn Center GEORGE PAPAGIANNIS (50) during the NBA D-League Basketball game between the Reno Bighorns and the Austin Spurs at the Reno Events Center in Reno, Nevada. 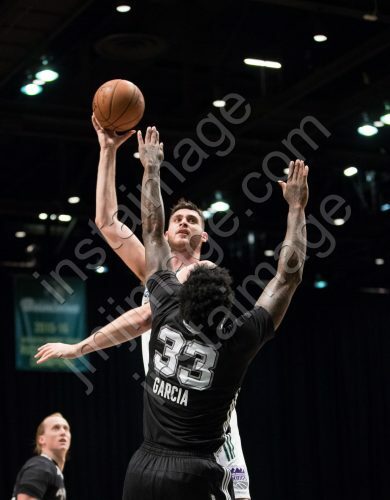 Austin Spurs Forward CHARLES GARCIA (33) draws a foul against Reno Bighorn Center GEORGE PAPAGIANNIS (50) during the NBA D-League Basketball game between the Reno Bighorns and the Austin Spurs at the Reno Events Center in Reno, Nevada. 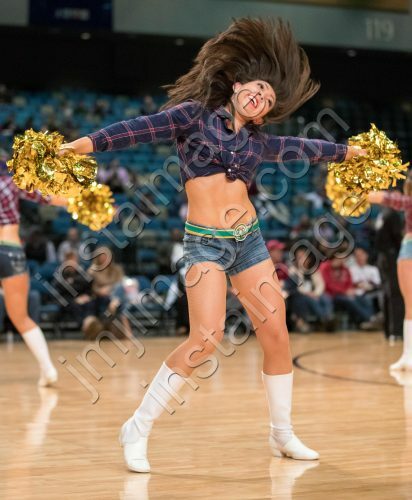 The Reno Lady Bighorn Dancers perform during the NBA D-League Basketball game between the Reno Bighorns and the Austin Spurs at the Reno Events Center in Reno, Nevada. 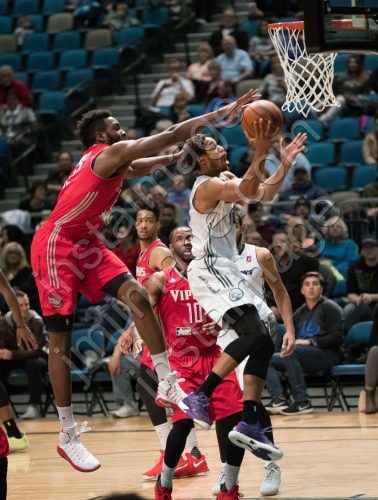 Reno, Nev. —- The Reno Bighorns (9-13) defeated the Austin Spurs (9-14) 97-91 Wednesday night at the Reno Events Center. 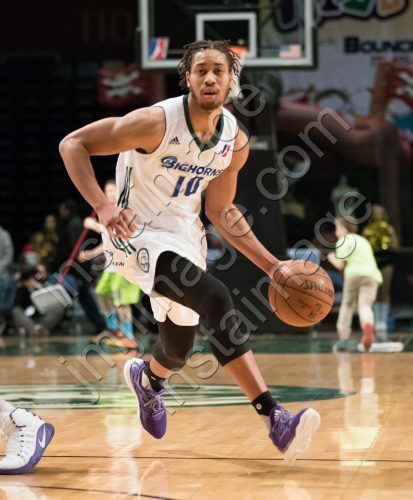 Sacramento Kings Affiliate Player Isaiah Cousins led the Bighorns with 19 points, two rebounds and five assists while Pe’Shon Howard scored a season-high with 18 points. Kings assignment player Skal Labissiere logged a double-double with 12 points and 10 rebounds while assignee Georgios Papagiannis also recorded a double-double with 10 points and 12 rebounds. Bryn Forbes who is on assignment from the San Antonio Spurs paced Austin with 15 points, two rebounds and five assists while Cory Jefferson logged a double-double with 11 points, 10 rebounds and two assists. The Spurs took control of the lead early, leading the Bighorns by four on two separate occasions in the first two minutes of the first frame. The Bighorns would knot the score up five times in the frame but would never lead in the quarter. The Spurs led 24-20 in the first quarter. The second quarter was a tight battle that saw four lead changes and three ties. The Bighorns took control of the score after a lay-up and a three from Patterson to have a 25-24 lead at the 10:23 mark. The Spurs got a one-point advantage over the Bighorns after a hook shot by Jefferson before the Bighorns pulled away by as many as five to hold a 30-28 lead over the Spurs mid-way through the frame. The Spurs rallied back to get a three-point advantage over the Bighorns with 1:28 left in the first half. After two free-throws from Cousins and a free –throw from Will Davis, the score would be tied at 42 going into the locker room at the half. The Spurs controlled the third frame, leading the Bighorns by more than nine in the quarter. 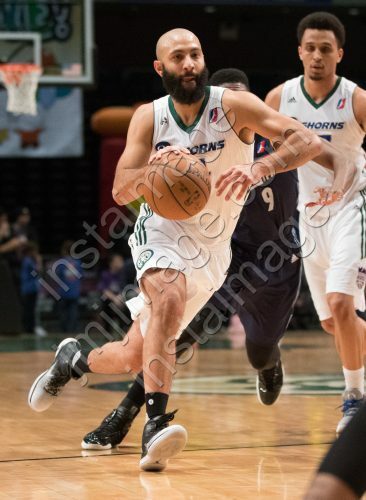 The Bighorns gained momentum in the fourth quarter outscoring the Spurs 29-22. Pe’Shon Howard opened up the frame with two triples to edge the Spurs 69-68 at the 9:31 mark. The Bighorns took a six-point advantage over the Spurs after a three from Howard followed by a hook shot and two free-throws from Labissiere. The teams battled for the advantage exchanging the lead twice before the Bighorns held a 82-76 lead with 3:23 left in regulation. Forbes tied the game at 87 at the 6.1 mark. Howard would attempt a three but would be beat by the buzzer, forcing the game into overtime. Howard scored 12 of his 18 points in the third frame. Mark Tyndale made a lay-up in the opening minutes of the first overtime frame followed by a jumper and a three from Patterson to take a 95-88 lead over the Spurs. The Bighorns would not relinquish the lead, securing a 97-91 victory over the Spurs. The Bighorns will return to the Reno Events Center on Friday, Jan. 13 to host the Canton Charge at 7 pm. 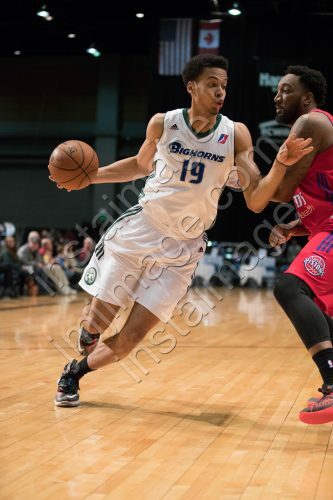 Reno Bighorn Center SKAL LABISSIERE (19) drives against Grand Rapids Drive Forward RAMON HARRIS (3) during the NBA D-League Basketball game between the Reno Bighorns and the Grand Rapids Drive at the Reno Events Center in Reno, Nevada. 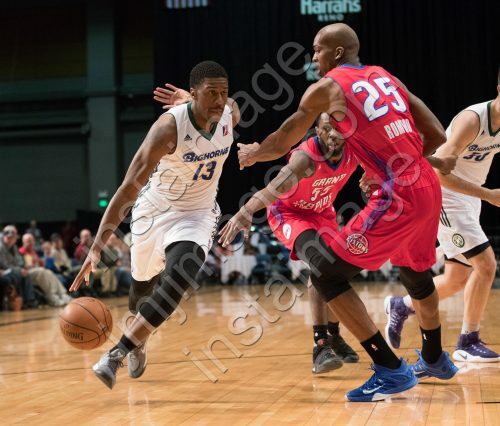 Reno Bighorn Guard LAMAR PATTERSON (13) drives against Grand Rapids Drive Forward RAMON HARRIS (3) during the NBA D-League Basketball game between the Reno Bighorns and the Grand Rapids Drive at the Reno Events Center in Reno, Nevada. 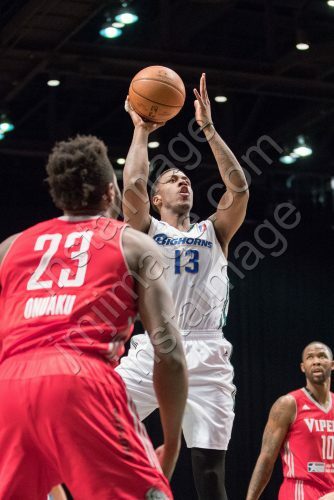 Reno Bighorn Guard LAMAR PATTERSON (13) during the NBA D-League Basketball game between the Reno Bighorns and the Grand Rapids Drive at the Reno Events Center in Reno, Nevada. Reno Bighorn Forward KADEEM JACK (2) dunks over Grand Rapids Drive Guard JORDAN CRAWFORD (15) during the NBA D-League Basketball game between the Reno Bighorns and the Grand Rapids Drive at the Reno Events Center in Reno, Nevada. 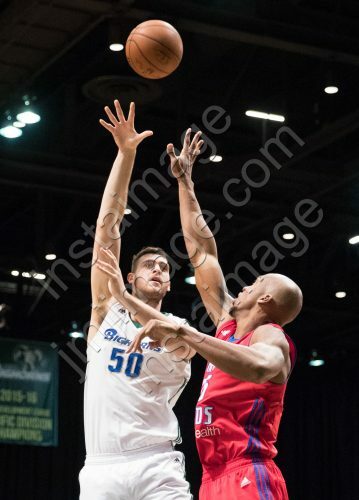 Reno Bighorn Center GEORGE PAPAGIANNIS (50) shoots over Grand Rapids Drive Forward ISMAEL ROMERO (25) during the NBA D-League Basketball game between the Reno Bighorns and the Grand Rapids Drive at the Reno Events Center in Reno, Nevada. 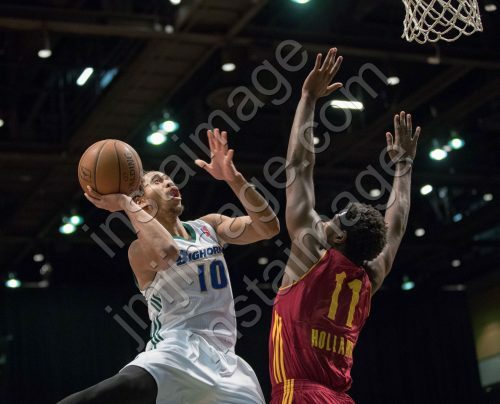 Reno Bighorn Guard PE’SHON HOWARD (5) drives against Grand Rapids Drive Guard RAY MCCALLUM (2) during the NBA D-League Basketball game between the Reno Bighorns and the Grand Rapids Drive at the Reno Events Center in Reno, Nevada. 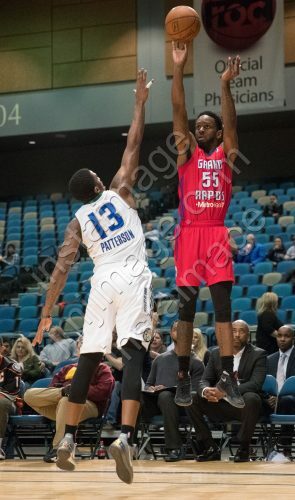 Grand Rapids Drive Guard KEVIN MURPHY (55) shoots from the corner against Reno Bighorn Guard LAMAR PATTERSON (13) during the NBA D-League Basketball game between the Reno Bighorns and the Grand Rapids Drive at the Reno Events Center in Reno, Nevada. Grand Rapids Drive Center CHRIS HORTON (5) dunks with Reno Bighorn Forward CHANE BEHANAN (24) and Reno Bighorn Guard REGGIE HEARN (37) watching during the NBA D-League Basketball game between the Reno Bighorns and the Grand Rapids Drive at the Reno Events Center in Reno, Nevada. 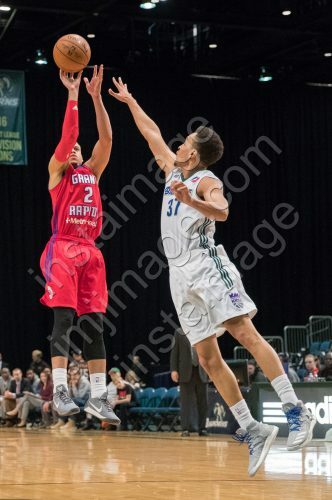 Grand Rapids Drive Guard RAY MCCALLUM (2) shoots over Reno Bighorn Guard REGGIE HEARN (37) during the NBA D-League Basketball game between the Reno Bighorns and the Grand Rapids Drive at the Reno Events Center in Reno, Nevada. 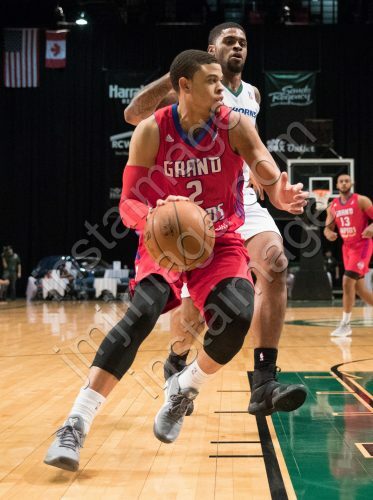 Grand Rapids Drive Guard RAY MCCALLUM (2) drives against Reno Bighorn Forward CHANE BEHANAN (24) during the NBA D-League Basketball game between the Reno Bighorns and the Grand Rapids Drive at the Reno Events Center in Reno, Nevada. 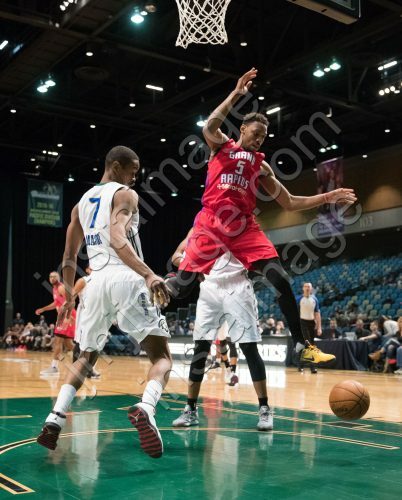 Reno Bighorn Guard RENALDO MAJOR (7) swats the ball away from Grand Rapids Drive Center CHRIS HORTON (5) during the NBA D-League Basketball game between the Reno Bighorns and the Grand Rapids Drive at the Reno Events Center in Reno, Nevada. 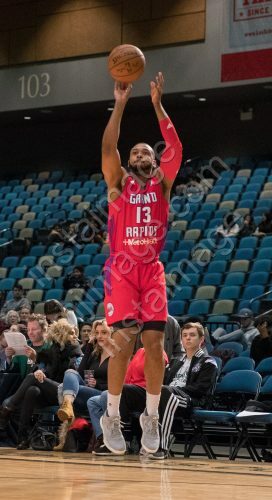 Grand Rapids Drive Guard ZEKE UPSHAW (13) shoots from the corner during the NBA D-League Basketball game between the Reno Bighorns and the Grand Rapids Drive at the Reno Events Center in Reno, Nevada. 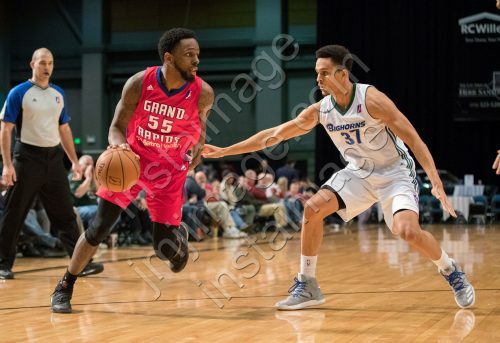 Grand Rapids Drive Guard KEVIN MURPHY (55) drives against Reno Bighorn Guard REGGIE HEARN (37) during the NBA D-League Basketball game between the Reno Bighorns and the Grand Rapids Drive at the Reno Events Center in Reno, Nevada. 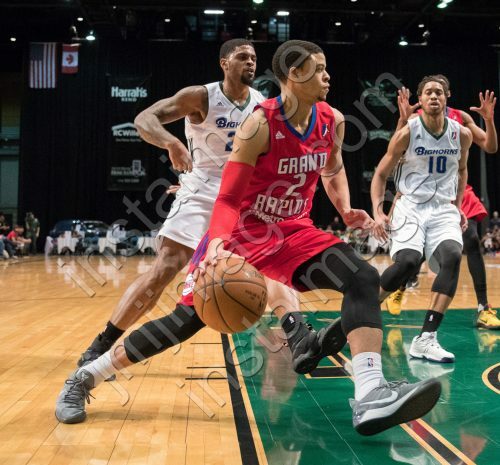 Grand Rapids Drive Guard TREY FREEMAN (10) during the NBA D-League Basketball game between the Reno Bighorns and the Grand Rapids Drive at the Reno Events Center in Reno, Nevada. 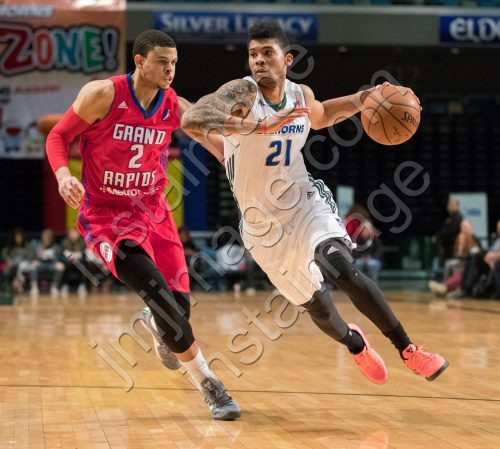 Reno Bighorn Guard JAMAL BRANCH (21) drives against Grand Rapids Drive Guard RAY MCCALLUM (2) during the NBA D-League Basketball game between the Reno Bighorns and the Grand Rapids Drive at the Reno Events Center in Reno, Nevada. 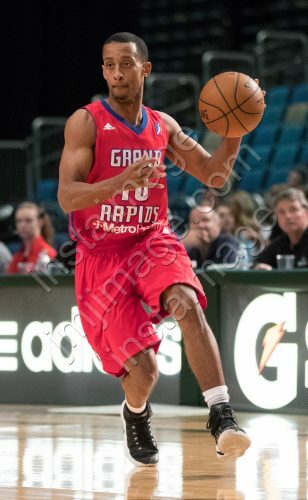 Reno Bighorn Guard ISAIAH COUSINS (10) during the NBA D-League Basketball game between the Reno Bighorns and the Grand Rapids Drive at the Reno Events Center in Reno, Nevada. Reno Bighorn Guard ISAIAH COUSINS (10) elevates for a reverse layup with Grand Rapids Drive Guard JORDAN CRAWFORD (15) and Grand Rapids Drive Guard CHRIS ANDERSON (24) watching during the NBA D-League Basketball game between the Reno Bighorns and the Grand Rapids Drive at the Reno Events Center in Reno, Nevada. 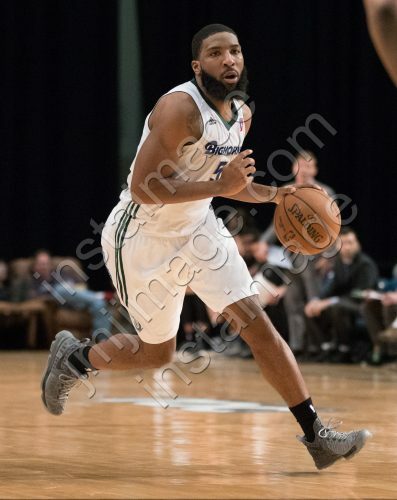 Reno, Nev. —- The Reno Bighorns (8-13) defeated the Grand Rapids Drive (11-12) 107-101 Monday night at the Reno Events Center. 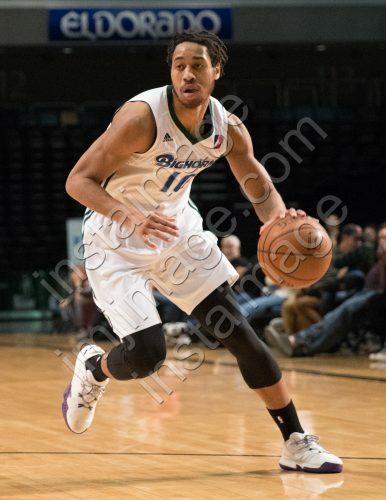 Sacramento Kings Affiliate Player Lamar Patterson led the Bighorns with 24 points, seven rebounds and eight assists while affiliate player Isaiah Cousins followed Patterson closely scoring 19 points, grabbing seven rebounds and adding eight assists. Kings Assignment Player Skal Labissiere logged a double-double with 17 points and 12 rebounds. Kevin Murphy paced the Drive with 23 points and 10 rebounds while Ramon Harris had 21 points, seven rebounds and two assists. The first quarter was a tightly contested battle that saw eight lead changed and four ties. The teams matched each other point-for-point knotting the score up at 20 at the 2:52 before the Bighorns pulled away to have a 28-22 lead heading into the second frame. The Bighorns controlled the second frame, leading the Drive by more than nine in the quarter behind a 52.6% shooting effort compared to the Drive shooting 40.9%. 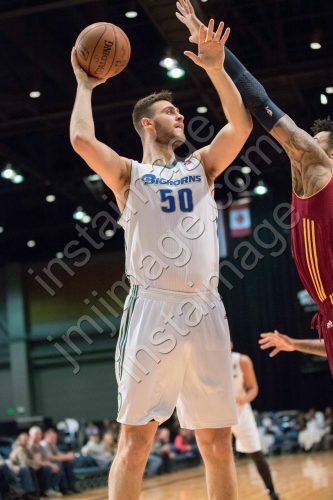 Papagiannis lead the Bighorns in the frame scoring eight points going 4-5 from the field. The Bighorns went into the locker room at the half with a 52-46 lead. The Drive rallied back coming out of the break to edge the Bighorns by one mid-way through the third frame. The Bighorns pulled away after a triple from Cousins and Patterson to lead by nine at the 2:00 mark. Drive’s Jordan Crawford scored three to cut the Drive’s deficit to six before Patterson scored three after stepping to the line twice to hold a nine-point lead over the Drive at the end of the third quarter. Labissiere and Cousins combined for 20 points in the frame. The momentum remained for the Bighorns to begin the final frame behind a 10-2 run to open their lead to as many as 17 by the 8:07 mark. Fueled by a 10-point spurt from Ray McCallum, the Drive cut their deficit to four with 1:36 left in play. 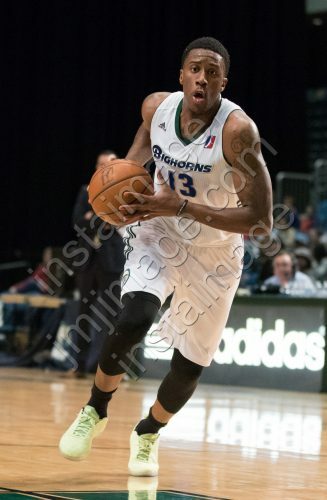 The Bighorns would not relinquish the lead to secure a 107-101 victory over the Drive. Patterson scored 17 of his 24 points in the second half. 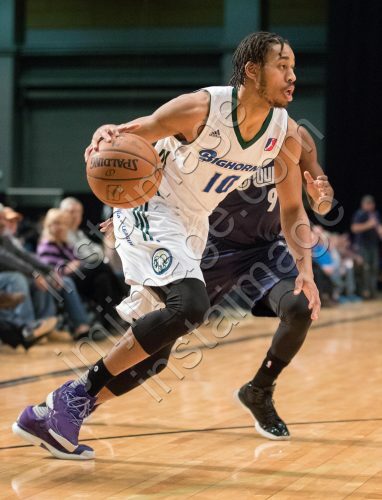 The Bighorns will return to the Reno Events Center on Wednesday, Jan. 11 to face the Austin Spurs at 7 pm. 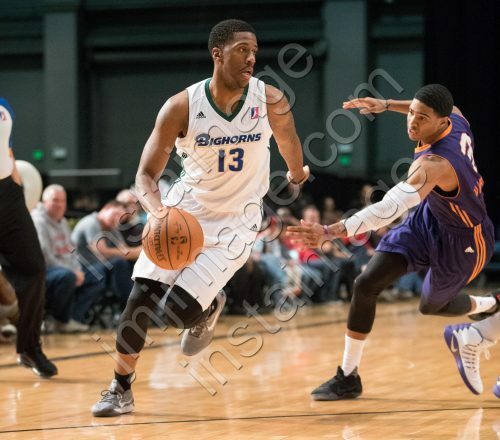 Reno Bighorn Guard LAMAR PATTERSON (13) drives past Northern Arizona Suns Guard SHAQUILLE HARRISON (3) during the NBA D-League Basketball game between the Reno Bighorns and the Northern Arizona Suns at the Reno Events Center in Reno, Nevada. 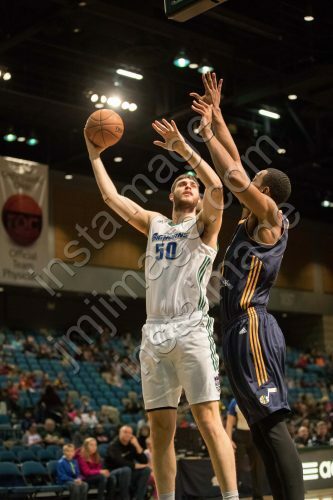 Reno Bighorn Center GEORGE PAPAGIANNIS (50) during the NBA D-League Basketball game between the Reno Bighorns and the Northern Arizona Suns at the Reno Events Center in Reno, Nevada. 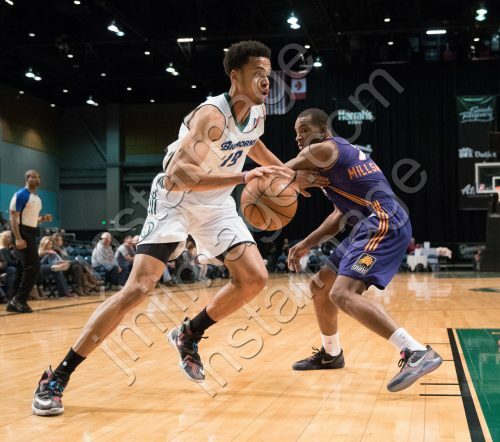 Reno Bighorn Center SKAL LABISSIERE (19) drives past Northern Arizona Suns Guard ELIJAH MILLSAP (7) during the NBA D-League Basketball game between the Reno Bighorns and the Northern Arizona Suns at the Reno Events Center in Reno, Nevada. Reno Bighorn Center SKAL LABISSIERE (19) dunks after beating Northern Arizona Suns Guard ELIJAH MILLSAP (7) to the hoop during the NBA D-League Basketball game between the Reno Bighorns and the Northern Arizona Suns at the Reno Events Center in Reno, Nevada. 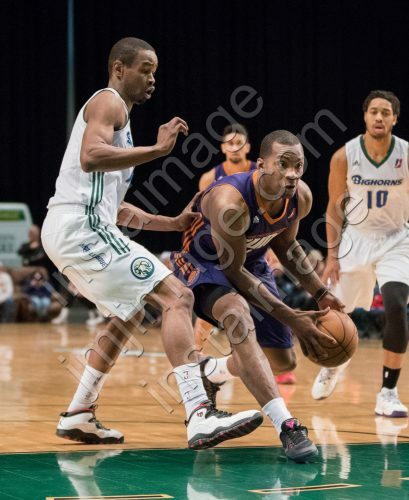 Reno Bighorn Guard ISAIAH COUSINS (10) drives against Northern Arizona Suns Guard ELIJAH MILLSAP (7) during the NBA D-League Basketball game between the Reno Bighorns and the Northern Arizona Suns at the Reno Events Center in Reno, Nevada. 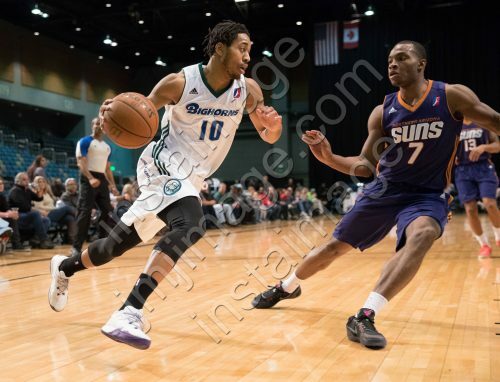 Reno Bighorn Guard ISAIAH COUSINS (10) during the NBA D-League Basketball game between the Reno Bighorns and the Northern Arizona Suns at the Reno Events Center in Reno, Nevada. Reno Bighorn Guard ISAIAH COUSINS (10) is fouled by Northern Arizona Suns Guard ASAAD WOODS (23) during the NBA D-League Basketball game between the Reno Bighorns and the Northern Arizona Suns at the Reno Events Center in Reno, Nevada. Reno Bighorn Guard LAMAR PATTERSON (13) during the NBA D-League Basketball game between the Reno Bighorns and the Northern Arizona Suns at the Reno Events Center in Reno, Nevada. 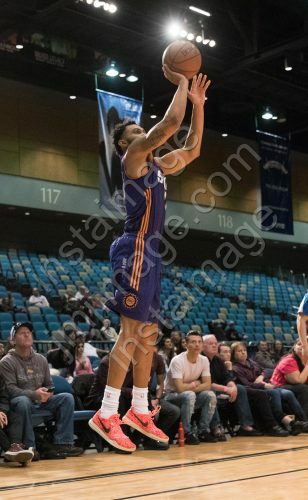 Reno Bighorn Forward KADEEM JACK (2) shoots for three during the NBA D-League Basketball game between the Reno Bighorns and the Northern Arizona Suns at the Reno Events Center in Reno, Nevada. Reno Bighorn Guard JAMAL BRANCH (21) during the NBA D-League Basketball game between the Reno Bighorns and the Northern Arizona Suns at the Reno Events Center in Reno, Nevada. 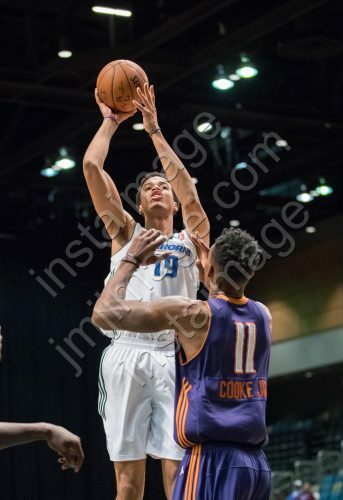 Reno Bighorn Center SKAL LABISSIERE (19) shoots over Northern Arizona Suns Forward DEREK COOKE JR (11) during the NBA D-League Basketball game between the Reno Bighorns and the Northern Arizona Suns at the Reno Events Center in Reno, Nevada. Northern Arizona Suns Guard ELIJAH MILLSAP (7) shoots over Reno Bighorn Center GEORGE PAPAGIANNIS (50) during the NBA D-League Basketball game between the Reno Bighorns and the Northern Arizona Suns at the Reno Events Center in Reno, Nevada. 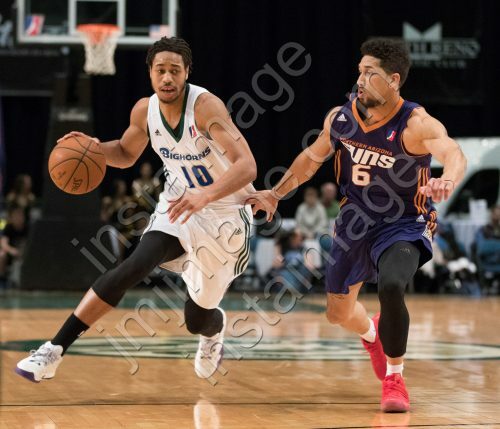 Reno Bighorn Guard ISAIAH COUSINS (10) drives against Northern Arizona Suns Guard ASKIA BOOKER (6) during the NBA D-League Basketball game between the Reno Bighorns and the Northern Arizona Suns at the Reno Events Center in Reno, Nevada. 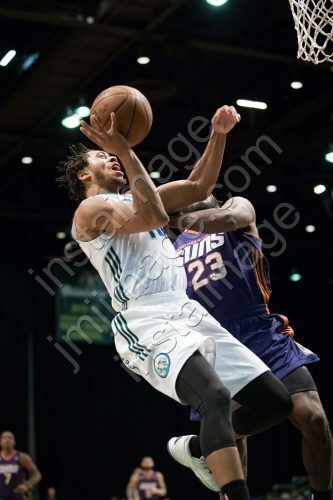 Northern Arizona Suns Guard SHAQUILLE HARRISON (3) draws a foul against Reno Bighorn Center SKAL LABISSIERE (19) during the NBA D-League Basketball game between the Reno Bighorns and the Northern Arizona Suns at the Reno Events Center in Reno, Nevada. 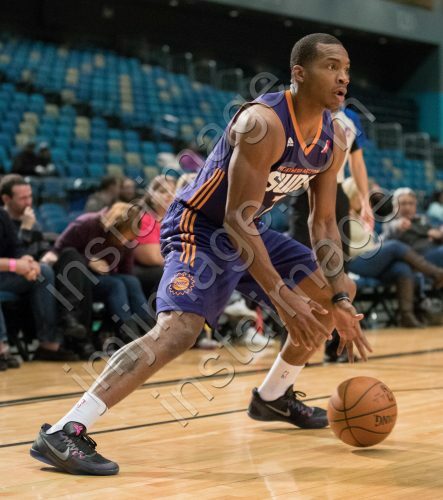 Northern Arizona Suns Guard ELIJAH MILLSAP (7) during the NBA D-League Basketball game between the Reno Bighorns and the Northern Arizona Suns at the Reno Events Center in Reno, Nevada. 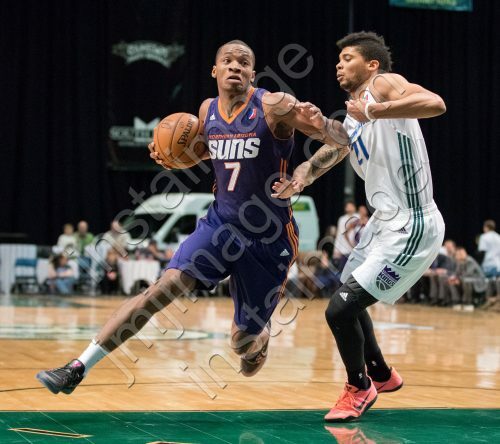 Northern Arizona Suns Guard ELIJAH MILLSAP (7) drives against Reno Bighorn Guard JAMAL BRANCH (21) during the NBA D-League Basketball game between the Reno Bighorns and the Northern Arizona Suns at the Reno Events Center in Reno, Nevada. 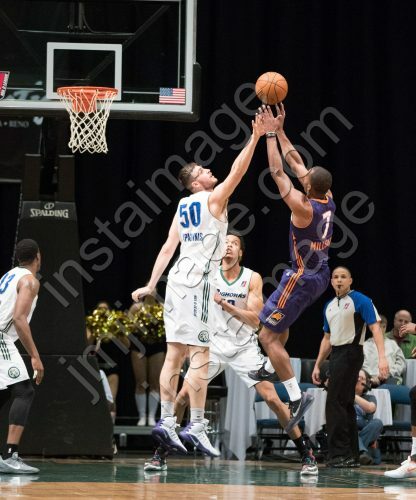 Northern Arizona Suns Forward JOHNNY O’BRYANT III (24) shoots over Reno Bighorn Center GEORGE PAPAGIANNIS (50) during the NBA D-League Basketball game between the Reno Bighorns and the Northern Arizona Suns at the Reno Events Center in Reno, Nevada. 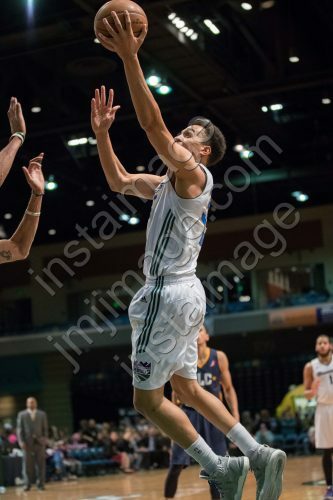 Northern Arizona Suns Guard XAVIER SILAS (13) shoots for three during the NBA D-League Basketball game between the Reno Bighorns and the Northern Arizona Suns at the Reno Events Center in Reno, Nevada. 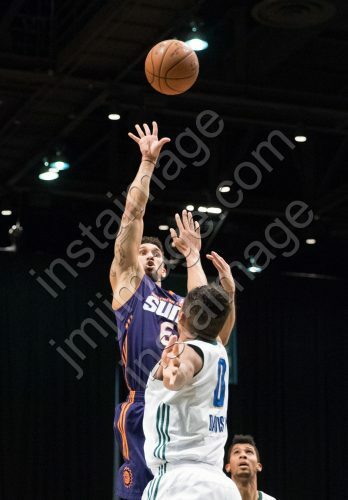 Northern Arizona Suns Guard ASKIA BOOKER (6) shoots over Reno Bighorn Forward WILL DAVIS II (0) during the NBA D-League Basketball game between the Reno Bighorns and the Northern Arizona Suns at the Reno Events Center in Reno, Nevada. 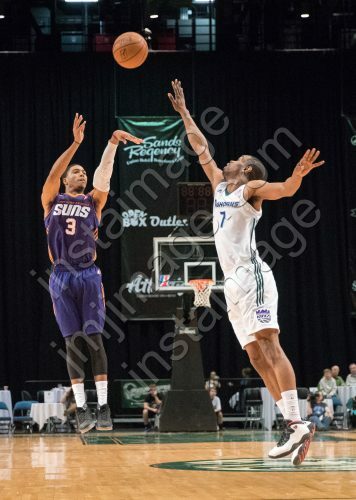 Northern Arizona Suns Guard SHAQUILLE HARRISON (3) shoots over Reno Bighorn Guard RENALDO MAJOR (7) during the NBA D-League Basketball game between the Reno Bighorns and the Northern Arizona Suns at the Reno Events Center in Reno, Nevada. Reno Bighorn Guard ISAIAH COUSINS (10) elevates to the hoop against Northern Arizona Suns Forward JOHNNY O’BRYANT III (24) and Northern Arizona Suns Guard SHAQUILLE HARRISON (3) during the NBA D-League Basketball game between the Reno Bighorns and the Northern Arizona Suns at the Reno Events Center in Reno, Nevada. 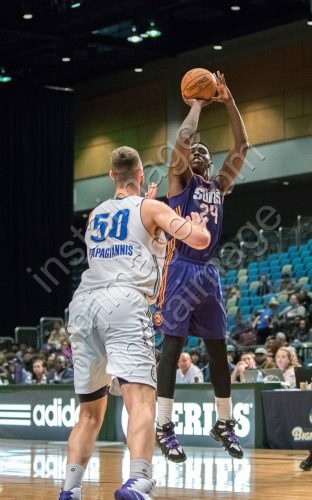 Northern Arizona Suns Forward JOHNNY O’BRYANT III (24) defends against Reno Bighorn Guard LAMAR PATTERSON (13) in the paint during the NBA D-League Basketball game between the Reno Bighorns and the Northern Arizona Suns at the Reno Events Center in Reno, Nevada. The Lady Bighorn Dancers perform during the NBA D-League Basketball game between the Reno Bighorns and the Northern Arizona Suns at the Reno Events Center in Reno, Nevada. 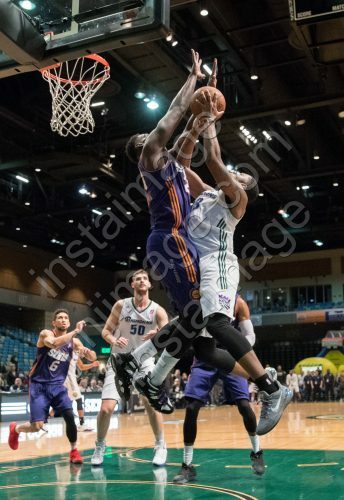 Northern Arizona Suns Guard ELIJAH MILLSAP (7) drives into the paint against Reno Bighorn Guard RENALDO MAJOR (7) during the NBA D-League Basketball game between the Reno Bighorns and the Northern Arizona Suns at the Reno Events Center in Reno, Nevada. 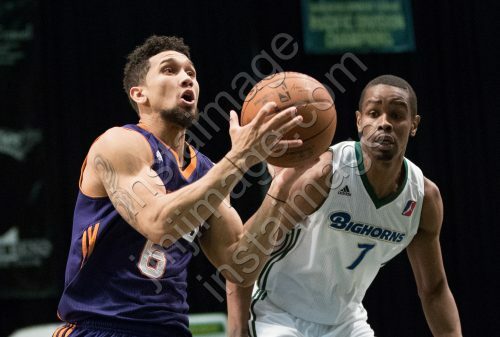 Northern Arizona Suns Guard ASKIA BOOKER (6) drives past Reno Bighorn Guard RENALDO MAJOR (7) during the NBA D-League Basketball game between the Reno Bighorns and the Northern Arizona Suns at the Reno Events Center in Reno, Nevada. 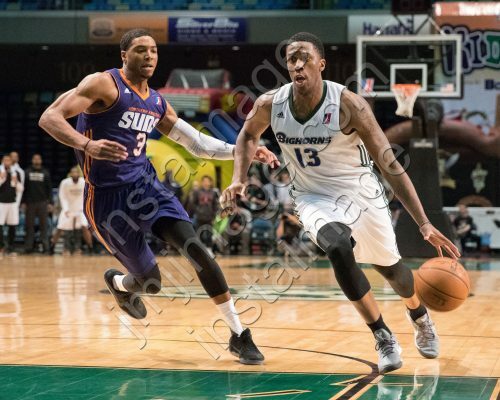 RENO, Nev. —- The Reno Bighorns (7-13) handed the Northern Arizona Suns (10-10) their ninth straight loss Saturday night in a buzzer-beater 91-89 finish at the Reno Events Center. 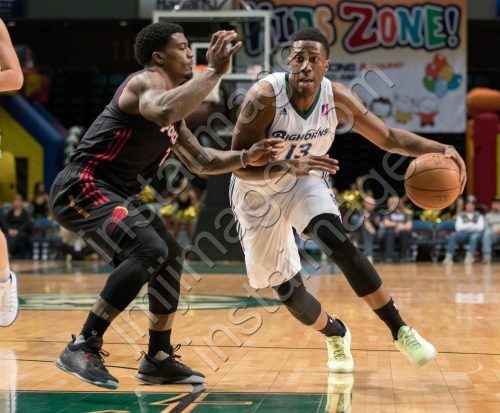 Kings Affiliate Player Lamar Patterson led the Bighorns with 31 points, eight rebounds and five assists while affiliate player Isaiah Cousins notched 23 points, three rebounds and three assists. Kings assignee Skal Labissiere scored 19 points and added eight rebounds. Elijah Milsap paced the Suns with 20 points, six rebounds and four assists while Johnny O’Bryant logged a double-double with 15 points, seven rebounds and 15 assists. The Suns took control of the game early, leading the Bighorns 20-12 at the mid-way point in the first quarter. The Bighorns rallied back to tie the game at 28 with 1.1 on the clock. Patterson made a lay-up with 1.0 remaining in play to give the Bighorns a 30-28 lead to end the first quarter. The Bighorns pulled away from the Suns leading by six early in the frame after a lay-up from Kadeem Jack and A jumper from Pe’Shon Howard. The Suns took control of the lead after going on an 11-2 run to take a 39-36 lead at the 5:39 mark. The two teams exchanged buckets the remainder of the frame with the Suns going into the locker room at the half with a 45-42 lead. The Suns kept the Bighorns at bay, leading by as many as 14 in the third quarter. The Bighorns headed up in the fourth quarter outscoring the Suns 22-11. Cousins opened up the final frame with a triple. 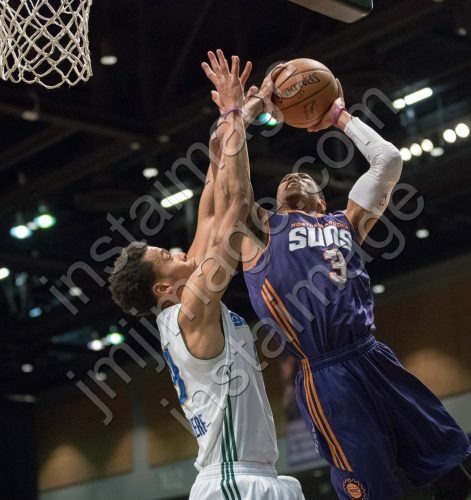 The Bighorns chipped away at the Suns lead getting within two points at the 6:00 mark. The Suns would respond to lead the Bighorns by seven with 4:09 left in play. 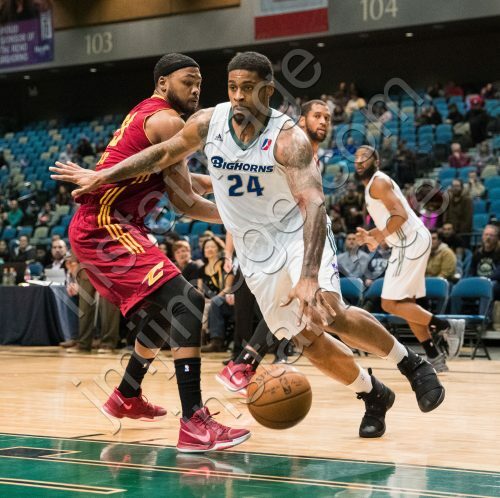 The Bighorns went on a 5-0 run to make it a two-point game at the 1:35 mark. Cousins stepped to the line and scored two to tie the game at 85. Shaquille Harrison would attempt a three with less than six seconds in play but would come up short to force the game into overtime. Cousins scored 13 points in the fourth quarter. Harrison made a lay-up in the opening minute of the first overtime frame. 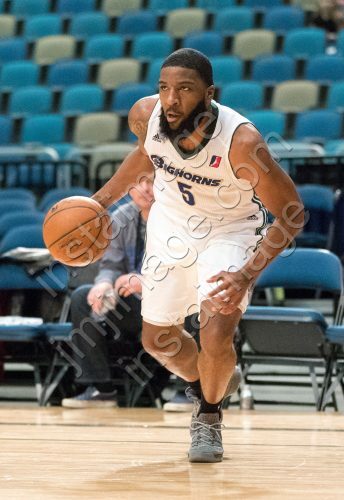 Patterson responded with a three at the 1:50 mark before Harrison made to free-throws after being fouled by Labissiere to take a one-point advantage over the Bighorns. 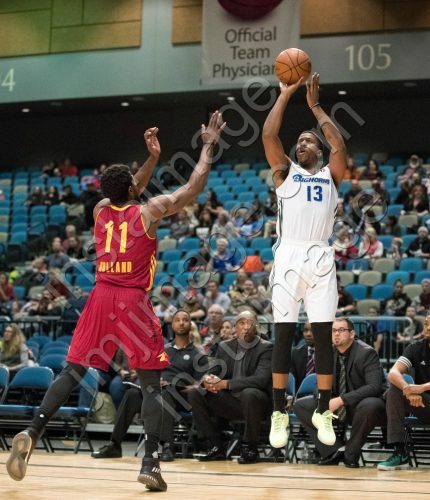 On the final possession, Renaldo Major in-bounded the ball to Patterson with 4.0 in play, Patterson sunk a triple with less than one second in play securing a 91-89 Bighorns victory over the Suns. The Bighorns will host the Grand Rapid Drive on Monday, Jan. 9 at 7 p.m.